Ancestry DNA® results can be tantalising – but also extremely frustrating. Being given a long list of strangers who may be your 5th to 8th cousins is certainly exciting – but in most cases it’s impossible to prove their connection to you. More often than not, there are no shared matches with other people, and the names in their family trees (if they have one) may have no overlap with your own. Hooray, then, for Ancestry DNA’s new ThruLines™ tool, which illustrates how you might be related to your DNA matches through a common ancestor. Basically, you’re given a list of ancestors that you share with DNA matches. By clicking on them, you can see how your family trees overlap. As well as helping you to see why some random stranger is on your list of DNA matches, ThruLines can also help to confirm some of your genealogical hunches – which, for me, is the main value of having taken a DNA test in the first place. For example, if I look at the ThruLines entry for my supposed maternal 4th great grandfather William Holdsworth (1771 – 1827), I find that I have one DNA match via his daughter Eliza, my 3rd great grandmother, which I already knew about (a second cousin), and three DNA matches via his daughter Phoebe (1796 – 1875) – which I didn’t previously know about. Opening up the tree, I discover that these are people who are descended from Phoebe’s son Thomas and daughter Ann, from her first marriage to Thomas Chamberlin (1794 – 1837). ThruLines tells me that one of these descendants is a 5th cousin of mine, while the other two are 5th cousins once removed. If I were relying simply on their individual DNA reports, I would never have discovered the nature of their connection to me: in all three cases, there are ‘no shared matches’, and only one of them has a single matching surname in their tree. 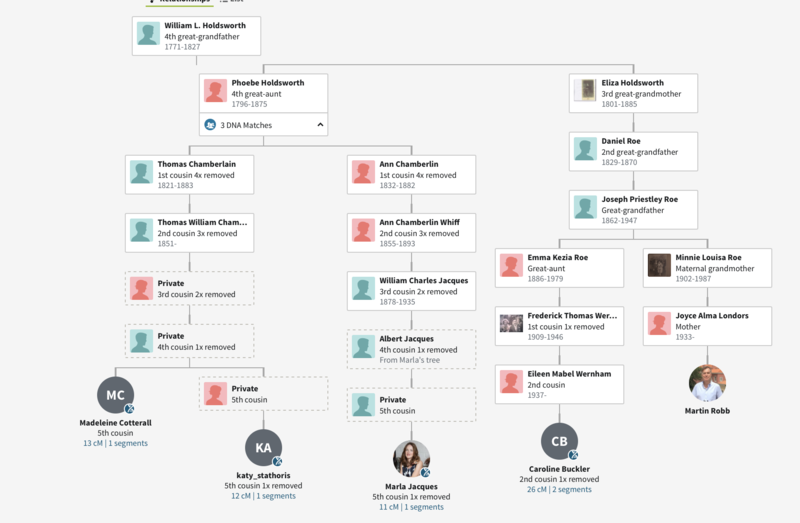 At the same time, this ThruLines connection provides me with confirmation that I’m on the right track in my research into my maternal ancestors, and that I am indeed descended from William Holdsworth, a shoemaker in Whitechapel and Bethnal Green in the early nineteenth century. This is not a huge surprise, but in other cases, ThruLines has provided evidence of connections about which I’ve had significant doubts. For example, I’ve often wondered whether my maternal 3rd great grandfather John Blanch (1802-1869), another East End shoemaker, was indeed the brother of Soho and Chelsea coachbuilder David Blanch (1810 – 1866), and the son of Bristol-born patten maker James Blanch (1755 – 1840), especially as there seemed to be some discrepancy in the christening records. However, ThruLines tells me that I have a DNA match with a descendant of David Blanch – a 5th cousin – and also one with another Blanch brother William Henry (1804 – 1857) – this time a 4th cousin once removed. I’m hoping that future matches via ThruLines will provide confirmation of more distant ancestors – but that, of course, relies on other researchers having ventured as far back in our shared families’ histories as I have. I recently took delivery of a copy of the death certificate of Caleb Evans, a coal porter of Biggleswade, Bedfordshire, who died on 3rd February 1842 at the age of 65. The certificate reveals that the person who registered Caleb’s death was none other than my maternal 3rd great grandmother, Eliza Roe. Why is this of interest? 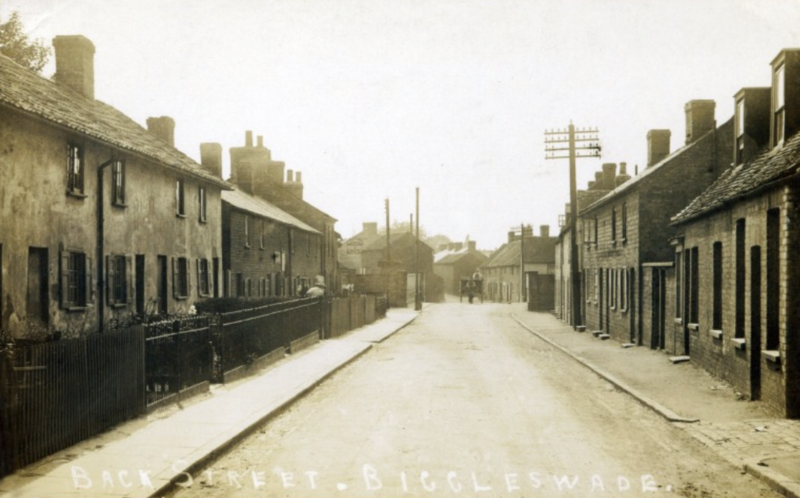 For some time, I’ve been trying to establish a definite connection between my Roe ancestors and the Evans family of Biggleswade. Eliza Roe had been born Eliza Holdsworth in 1801, the daughter of Stepney shoemaker William Holdsworth and his wife Lydia Evans, the daughter of Francis and Elizabeth Evans. William and Lydia were members of the Little Alie Street Baptist chapel in Whitechapel. As a young woman, Eliza seems to have travelled from London to Biggleswade where she met and married Daniel Roe, another Baptist shoemaker, in 1825. One of the witnesses at the wedding was Mary Evans, who seems to have been the daughter of Caleb Evans, who was apparently a deacon and lay preacher at the Baptist ‘Old Meeting’ in Biggleswade. This suggests that Eliza may have been drawn to Biggleswade by the presence there of her Evans relatives. Recent research by my distant relative Keith Roe found a possible connection between the Roe family and another Evans – Rev. 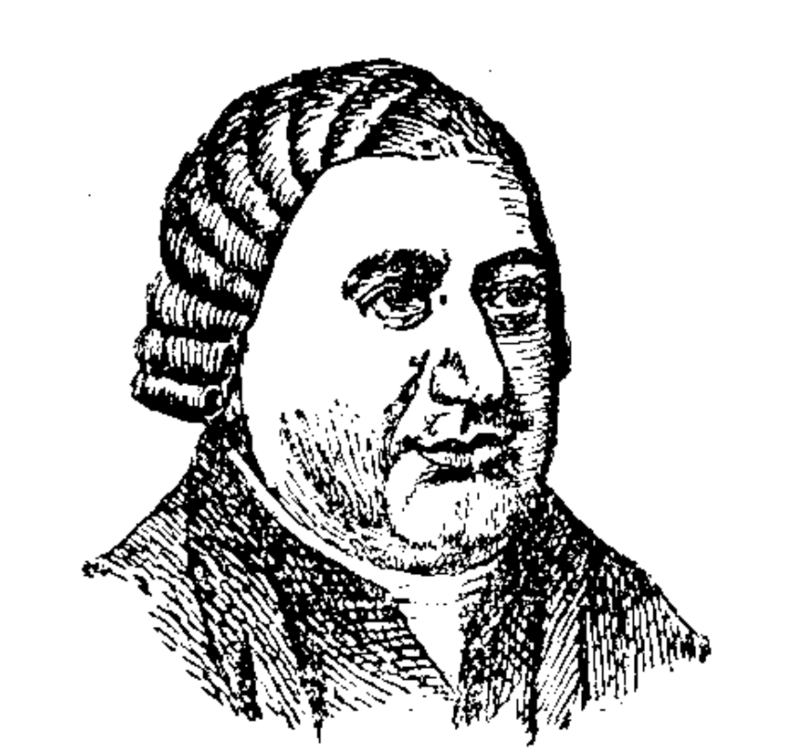 David Evans, the Baptist minister of Biggleswade in the late eighteenth century. Keith has discovered that David Evans married Mary Moss, the sister of Martha Moss, who was married to a certain William Roe of Pirton, which is across the county border in Hertfordshire but only ten miles from Biggleswade. There’s a strong likelihood that William Roe was related to the Daniel Roe who married Eliza Holdsworth. Now, it’s possible that Eliza Roe registered the death of Caleb Evans simply because they were neighbours – the 1841 census shows Caleb living in Back Street, Biggleswade, while Eliza lived in nearby Sand Pit Lane – or because they were fellow worshippers at the town’s Baptist chapel. But given that Eliza’s mother was an Evans, as well as the presence of Caleb’s daughter Mary at Eliza’s wedding, it seems much more likely that Caleb was actually a relative of Eliza’s. As to why the death wasn’t registered by Caleb’s widow Ann, it’s possible that she was too old or too ill: she was 70 years old in 1842, and would die two years later. Caleb’s wife Ann was born Ann Marsom, and came from a long-established Bedfordshire Baptist family. As for Caleb’s origins, the 1841 census record notes that he was born outside the county, but we are still no clearer about his family background. Could he have been the son of Rev. David Evans, or related to him in some other way? David Evans was born in Mydffai, Camarthenshire, Wales, in about 1710. He took up his post in Biggleswade in 1751 and in the same year married Mary Moss in Potton, a village a few miles to the north of the town (coincidentally, or perhaps not, the village where Ann Marsom would be born twenty years later). David would have been about forty years old when they married, but Mary was not quite nineteen, having been born in 1732. So it’s just about possible that she could have had a child in 1777, when she would have been in her mid-forties. The problem is: Mary Evans, née Moss, makes no mention of any children in her will of 1806 (her husband David had died in 1786). So the search goes on. It would be a major breakthrough if we could find the record of Caleb Evans’ birth, or discover more about the origins of Eliza Roe’s maternal grandfather, Francis Evans. William Robb was employed by Witherby’s of Birchin Lane, Cornhill, London, E.C. for 45 years prior to his death in 1888. William Robb (1813 – 1888) was my great great grandfather, the son of my 3rd great grandparents Charles Edward Stuart Robb (1779 – 1853) and Margaret Ricketts Monteith (1782 – 1843). Born in Richmond, Yorkshire, in 1813, William came to London with his Scottish-born parents in about 1830 and in 1836 married my great great grandmother Fanny Sarah Seager. Fanny died shortly after giving birth to my great grandfather, Charles Edward Robb in 1851. In 1854 William married his second wife, Marianne Mansfield Palmer. William was described in the census record of 1841 simply as a ‘clerk’, but in the census records of 1851, 1861 and 1871 his occupation is given more precisely as ‘law stationer’s clerk’, and in 1881 as ‘stationer’s clerk’. In my last post, in which I reconstructed my ancestors’ lives in the London of Charles Dickens, I wondered if William might have been employed by William Seager, a Bloomsbury law stationer, and if that was how he met his wife Fanny. Some years ago, I speculated that William Robb might also have worked for Walter Blanford Waterlow, a law stationer with offices at 49 Parliament Street, since my ancestor gave this as his address when he registered the death of his brother George William Robb in 1847. However, the information about William Robb’s employment at Witherby’s is the first real evidence we’ve had of his place of work. If he had been working for Witherby’s for 45 years at the time of his death, that means William started work there in 1843, when he would have been thirty years old. He had been married to Fanny for seven years and by the end of the year was the father of one son, William junior, and a daughter, Elizabeth Margaret, another daughter, Fanny Margaret Monteith, having died in infancy three years earlier. Given his age in 1843, it seems likely that William had at least a decade of work experience behind him when he started at Witherby’s, so it’s still possible that he had been employed by William Seager during this time, though it does seem to rule out the possibility that he was working for Waterlow in 1847, and means that his use of 49 Parliament Street as an address in that year remains something of a mystery – assuming, of course, that the information in the family Bible is accurate. 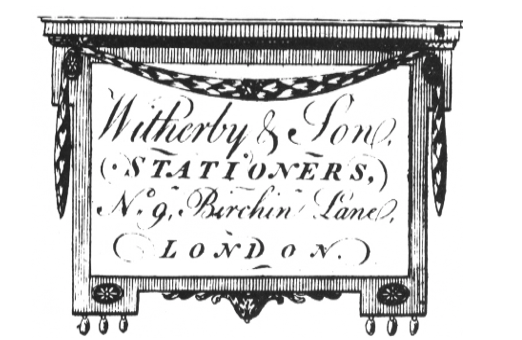 Witherby’s, one of the oldest publishing companies in Britain, was started by twenty-one-year-old Thomas Witherby in 1740 at 9 Birchin Lane, next to the Sword Blade coffee house. 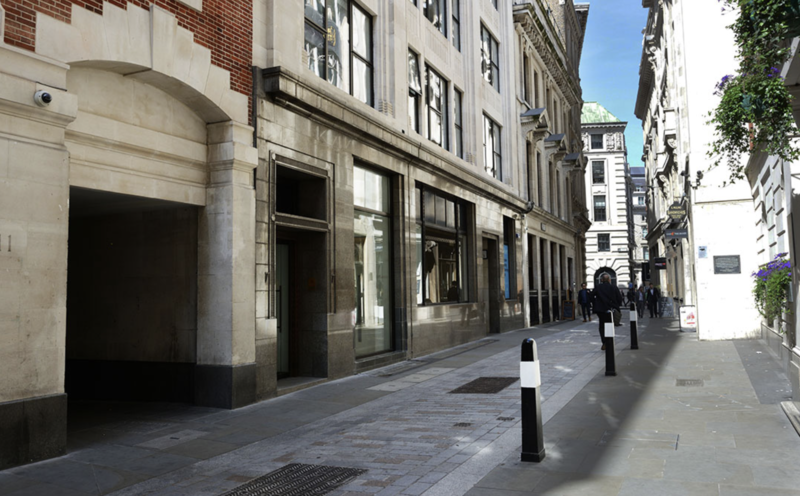 The location served as a convenient shortcut between the Royal Exchange on Cornhill and Lombard Street. Clients would bring Thomas their wills and marriage settlements, as well as articles of agreements between merchants, for him to write up with his apparently ‘exceptional’ handwriting. The company was passed down from father to son for seven generations. By 1810, as many as thirty writers were employed by the firm. In the early decades of the nineteenth century ownership of the company devolved to William Witherby, whose son William Henry was also employed as an apprentice. In 1817 William was elected to the Court of the Stationers’ Company, becoming Master for the year 1821-22. He retired in 1834 aged 76, having been with the firm for 62 years. 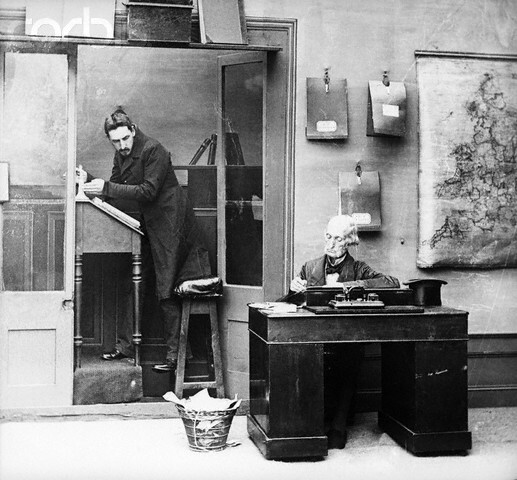 In 1838, Witherbys opened a branch office and shop in Westminster, increasing the amount of parliamentary business the firm dealt with. The company acquired a printing business in 1860, a well-timed move as in 1862 the Lord Chancellor decreed that all chancery affidavits and depositions were to be printed. A year later Walter and William Henry retired leaving Henry Forbes Witherby as sole partner. The company’s records are held by London Metropolitan Archives and include partnership deeds, minutes, liquidation papers concerning acquisitions; and balance sheets, journals, ledgers and account books. A highlight is Thomas Witherby’s Precedent Book containing pro forma specimen court documents and forms written in his hand intended for the guidance of his staff of law writers. Apparently Witherby’s was featured in the television series Who Do You Think You Are? when sports commentator and former footballer Gary Lineker was filmed at Witherby’s, viewing a document signed by his ancestor Thomas Billingham, who, like William Robb, was one of the firm’s clerks. The programme suggests that Billingham learned to write to the standard expected of a law clerk during his time as a pupil at Christ’s Hospital, and that he then served an apprenticeship. I wonder if my great great grandfather’s path to his long career at Witherby’s was similar – and whether the company’s archives include any examples of his work? I’m in the habit of reading a Dickens novel in the weeks leading up to Christmas. This year it’s Nicholas Nickleby, last year it was Bleak House, and the year before that Our Mutual Friend. My preference is for the books set wholly or partly in London: there’s something about this time of year that makes me want to imaginatively inhabit the city of my birth in those first few decades of the nineteenth century. My brother Michael, whose mini-biography of Dickens will be published next year, has a different tradition: every December he and his family re-read A Christmas Carol, which has the dual advantage of a London setting and a seasonal message. I can’t read Dickens, or imagine Dickens’ London, without thinking of my Robb ancestors, who were living there at the very time that he was writing. And conversely, when I’m researching the lives of those ancestors, Dickens frequently comes to mind. Not only did my forbears reside in the parts of London that he writes about, but their lives had many similarities with his own. What’s more, their stories often strike me as positively Dickensian, as if life were imitating, or anticipating, art. 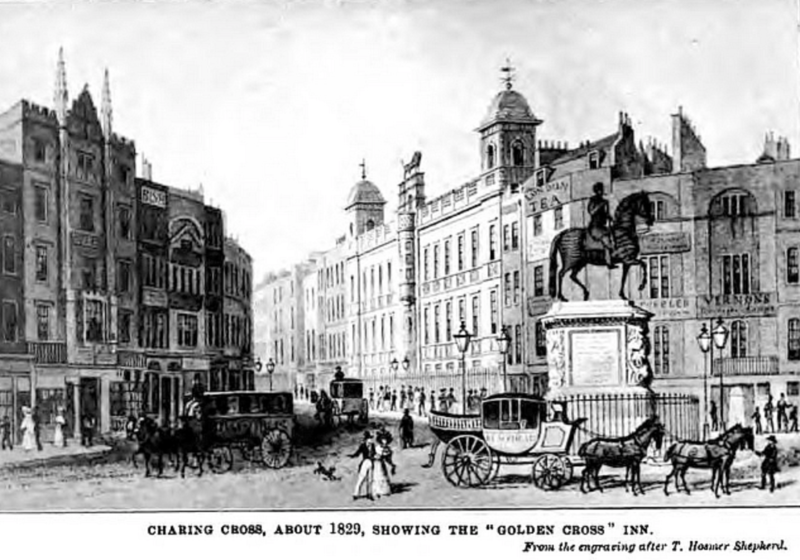 In this pre-Christmas post, I want to offer a glimpse of my ancestors’ lives in Dickens’ London. What were my great-great and great-great-great grandparents doing – where were they living and working, what was happening in their lives – when Charles Dickens was writing, just a few streets away? To focus our attention, I’ll attempt to re-construct my Robb forbears’ lives on a specific date: the day that A Christmas Carol was published, Tuesday 19th December 1843, exactly 175 years ago today. Let’s imagine that we could travel back in time to that day – a mild day for December, by all accounts – and find ourselves, for argument’s sake, outside the offices of Dickens’ publisher, Chapman and Hall, at No. 186, The Strand. Then let’s imagine that we are walking along that broad, busy street, bustling with carts and carriages, in the direction of Trafalgar Square. 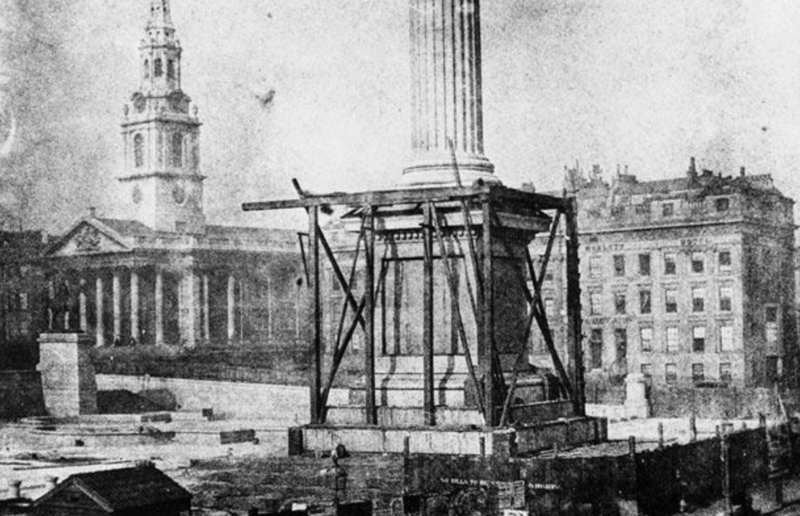 On arrival, we’ll discover that the square itself is still under construction – it would only be completed in 1845 – and that the famous statue of Nelson had only been placed on top of its column in the previous month. If we then look to the left towards Westminster, past the famous statue of King Charles I, we’ll see more building work in progress in the distance. The medieval Palace of Westminster had been destroyed by fire in 1834, and Charles Barry’s grand Gothic replacement wouldn’t be finished for another ten years. Immediately in front of us, between Trafalgar Square and the Houses of Parliament, we can see the street we know today as Whitehall, though in the 1840s the official address of its upper end was Charing Cross. Here, on the left hand side as you look towards Parliament, is a jumble of shops and inns, most of them with two or three floors of residential accommodation above – as is clearly visible in this image from 1839, thought to be the earliest photograph of London. One of those buildings on the left hand side of the street, in the middle distance in the photograph (just before the image becomes blurred), was home to my great-great-great-grandparents. 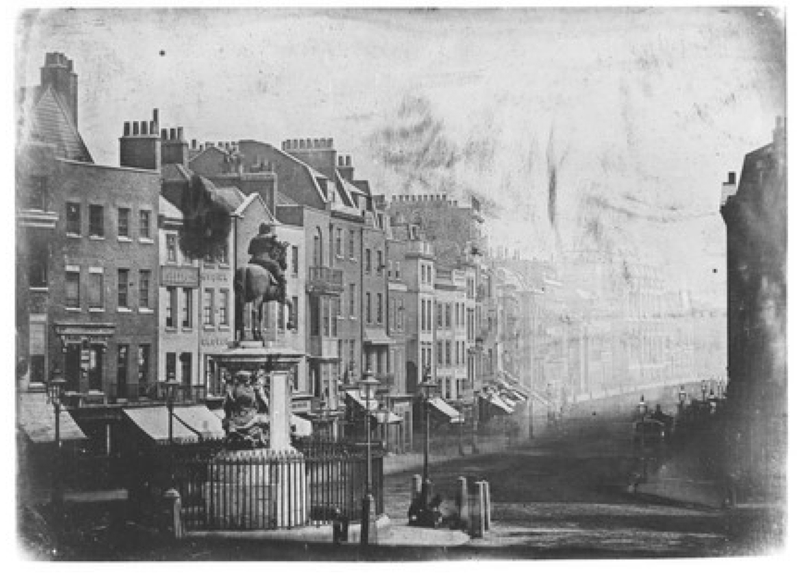 As the late Gavin Stamp wrote in The Changing Metropolis: earliest photographs of London 1839-79, this particular image is ‘hauntingly and tantalisingly beautiful’. He adds: ‘The calm beauty of the street is clear, as are the details of the shops and houses. All is recorded with tantalising precision. All is so real that, Alice-like, one is tempted to enter the picture’. So let’s do that. Starting on the corner of the street, outside the shop of William Coles, trussmaker, we find ourselves passing the premises of Charles Prater, an army clothier, followed by William Jolley the glover, Richard Morse the watchmaker, Johnston the confectioner, Stubbing the butcher, and Walter Oram the baker (I gleaned all of this information from contemporary census records), before we come to the King’s Arms, which had been the scene of violent anti-pressgang riots half a century earlier. Once past the inn we arrive at our destination. Sandwiched between the King’s Arms and a bookshop belonging to a certain Francis Pinkney is No. 29 Charing Cross, its ground floor occupied by a tobacconist’s shop, owned in the 1840s by a young man by the name of Matthew Cholerton. 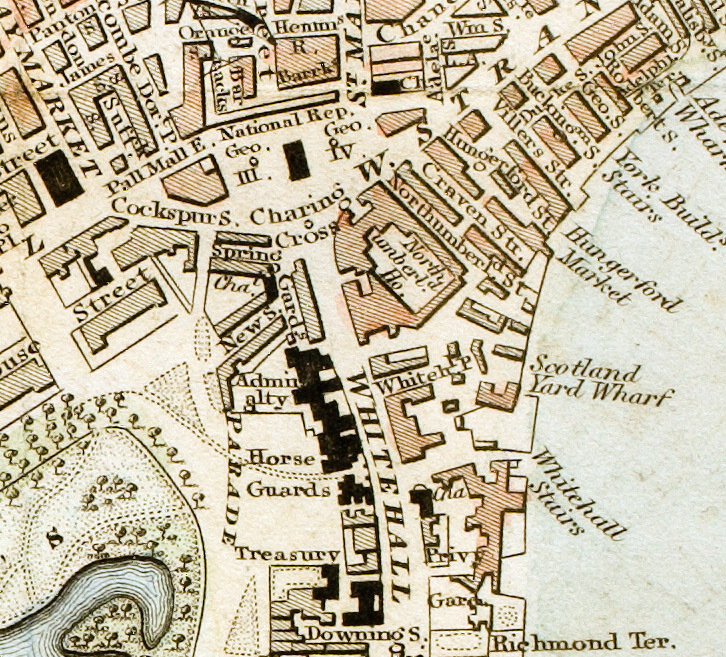 Map showing Charing Cross and Whitehall in the 1830s. If we were to enter the tobacconist’s shop and walk through to the stairs at the back, leading to the residential apartments above, we would find that, in addition to the shop’s proprietor, there are two other families living in this building, probably occupying rooms on separate floors. One of these apartments is occupied by a middle-aged man named Geoffrey Atkins, his young wife and their five-year-old son. If we were to knock on the door of the other apartment, depending on the time of day, it might be opened by a man in his early sixties, perhaps dressed in the wide-collared tailcoat that he wears for his job as a legal clerk (an occupation that Dickens himself had followed as a young man). I imagine him leaving the house to spend each day sitting at a tall desk, rather like Bob Cratchit (and wondering, like Cratchit, whether he’ll be allowed the day off work next Monday to celebrate Christmas), possibly at the Inns of Court at the far end of the Strand. When he speaks, you can still catch the hint of a Scottish accent, though he left the land of his birth some thirty years ago. This man is my great-great-great-grandfather Charles Edward Stuart Robb. He recently celebrated his sixty-fourth birthday, though I doubt it was a particularly happy occasion. Just a few weeks earlier, he had buried his wife, my great-great-great- grandmother Margaret Robb, at the nearby church of St Martin-in-the-Fields. She had died on 1st December 1843, at the age of sixty-one, from ‘bilious obstruction’. Charles and Margaret Robb had moved to London, with two of their three sons and one of their two daughters, some time in the late 1820s or early 1830s. According to family records, Charles had been born in 1779 in rural Aberdeenshire, the son of a farmer who fought for the Bonnie Prince in the ’45: hence his Christian names. Charles married Margaret Ricketts Monteith in Glasgow in 1802. Another family tradition claims that she was the granddaughter on her mother’s side of the Jacobite Viscount Stormont, though I’ve yet to find any independent evidence of this. Recently I speculated that Margaret’s middle name suggested a link to the Ricketts family who were merchants and landowners in Jamaica. If so, this may have been how she and Charles met, since his brother George Robb was a Glasgow merchant, also with Caribbean connections. Another brother, Rev. William Robb, was an Episcopal clergyman in St Andrews, chaplain to Lord Elibank, and a published poet. Both brothers were long dead by 1843. I’ve always imagined Charles as the black sheep of the family, failing to emulate either the wealth or eminence of his brothers. Although he described himself in official documents as a ‘gentleman’, Charles worked mostly as a humble clerk and, certainly after the move to London, lived in extremely modest circumstances. Perhaps he was like Newman Noggs in Nicholas Nickleby: a gentleman who had fallen on hard times? Certainly the locations of his children’s christenings suggest someone constantly on the move, in search of work and struggling to keep his head above financial waters. He and Margaret moved first to Aberdeen, then to Alloa, then Kilmarnock, before crossing the border and arriving in Yorkshire. For a time they lived in Whitby, then Richmond (where their son William, my great-great-grandfather was born in 1813) and then Malton, where Charles advertised himself as an accountant and engraver. And so finally to London, where I imagine them arriving by coach at Charing Cross – at about the time that the fictional Pickwick Club was meeting at the nearby Golden Cross Hotel – and settling on the nearest available accommodation. Not all of their children accompanied Charles and Margaret Robb to London. Their eldest daughter, Matilda, aged thirty-eight and still unmarried in 1843, was at this time working as a lady’s maid for Lady Frances Bassett, heiress to a tin mining fortune, at Tehidy Park, her stately home near Redruth in Cornwall. Charles and Margaret’s youngest son John, who was twenty-seven in 1843, is described in records from this period as a mariner, though he would later follow in his father’s footsteps and work as a legal clerk, for a parliamentary agent. His whereabouts in December 1843 are unknown, but it’s likely he was already wooing Mary Ann Downes, the Lambeth shoemaker’s daughter whom he would marry in the following spring. Charles and Margaret’s youngest child Elizabeth, who was now twenty-three, had come with them to London, but by 1843 she was married and living elsewhere in the city. Two years earlier she had married Derbyshire-born dentist Joseph Boden. I’ve written a whole blog about my suspicion that Joseph and Elizabeth were both bigamists, Joseph with Georgiana Westbrook – who sounds like a character from Thackeray – and Elizabeth with ‘professor of pianoforte’ Edmund Vineer – his surname reminiscent of the nouveau riche Veneerings in Our Mutual Friend. In fact, the whole story of Elizabeth and Joseph’s married life, with its sad ending in separation and suggestions of domestic violence, has a decidedly Dickensian flavour. Charles and Margaret’s eldest son, named Charles Edward after his father, had accompanied them to London but died of a fever in 1836 at the age of 26. Two other sons had been at home with Charles and Margaret at the time of the 1841 census. George William, who would have been thirty-two years old in 1843, seems to have remained single. He also worked as a legal clerk and may already have moved out to nearby Villiers Street, off the Strand (close to Hungerford Stairs, where twelve-year-old Charles Dickens had been put to work in Warren’s Blacking Factory). The other son, my great-great-grandfather William Robb, who was thirty years old in 1843, must have been paying his parents a visit on the night the census was taken, since he had been a married man since 1836. In May of that year William had married Fanny Sarah Seager at the church of St George the Martyr, Queen Square, Holborn, just a few streets from where Charles Dickens was living at the time, in Doughty Street. Fanny was the daughter of Samuel Hurst Seager, a porter at the Inns of Court. William Robb would spend the whole of his working life as a law stationer’s clerk, and I’ve often wondered if he met Fanny through working for one of her relatives. A law stationer by the name of William Seager lived in Little James Street, not far from St George’s church, and even closer to Dickens’ home. (I wonder if he was he anything like Mr Snagsby, the law stationer in Bleak House?) Was this William Robb’s employer, and did he introduce him to Fanny? Among the Seagers […] there appears briefly an affluent and unencumbered uncle to whom my great-grandfather [i.e. Samuel Hurst Seager] was heir. The story was that this uncle took his now impoverished nephew to Scotland to see the estates he would inherit and on the return journey died intestate in the family chaise. His fortune was thrown into Chancery and my great-grandfather upon the world. Marsh notes that her relatives were initially sceptical of the tale, adding that ‘stories of “riches held in Chancery” have a suspect glint over them, as if the narrator had looked once too often into “Bleak House”‘. But apparently evidence confirming the story was found among the papers of Marsh’s grandfather, Edward William Seager, after his death. My great-great-grandmother Fanny Seager certainly grew up in less than luxurious surroundings. The Seagers lived in Crown Court, a narrow alley leading directly off the north side of the Strand, to the east of St Clement Danes church and forming part of a dense network of streets between the Strand and Lincoln’s Inn Fields. These streets would be demolished in 1870, to make way for the Royal Courts of Justice. The Middle Temple, where Fanny’s father Samuel was employed, was on the south side of the Strand, immediately opposite the entrance to Crown Court. Samuel Hurst Seager died in 1837, the year after Fanny’s marriage to William Robb. The Seagers were Nonconformists, whereas the Robbs had been Episcopalian in Scotland and thus Anglicans when they moved to England. At some stage, my great-great-grandfather William Robb embraced Methodism. Perhaps his conversion predates Fanny, and explains how he met her, but more likely it was a result of her influence. 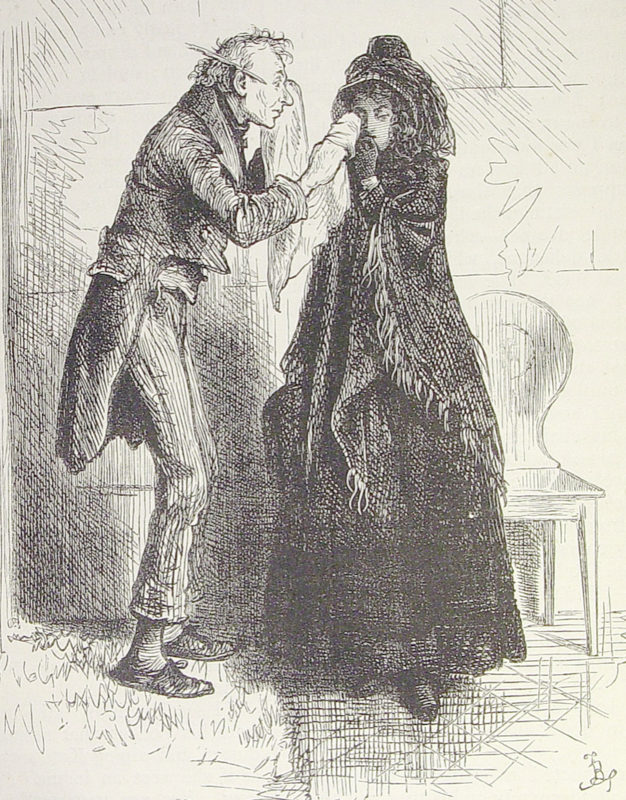 (Dickens, of course, had something of an antipathy to Nonconformists: see the unflattering portrayals of Mr Chadband in Bleak House, and Mrs Clennam in Little Dorrit, among others.) 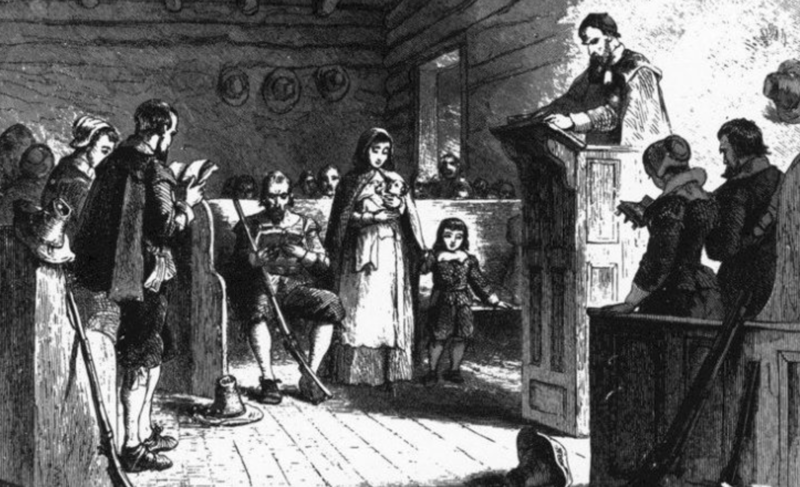 Whatever the truth of the matter, William initiated a family association with Methodism that would be passed down through the Robb family, from father to son: my own father only recently retired as a Methodist lay preacher. William and Fanny’s first child, Fanny Margaret Monteith Robb, had been born in 1838 at 6 Tavistock Street, Covent Garden, but had died of croup two years later. By the time their son William Henry was born in 1841 the couple had moved to 12 Compton Street in Soho. (Karl Marx and his family were living just around the corner in Dean Street at about this time.) A move along the road to 33 Compton Street followed soon afterwards. It was here that their daughter Elizabeth Margaret was born on 1st December – the very day that her grandmother Margaret died, hence the child’s middle name. 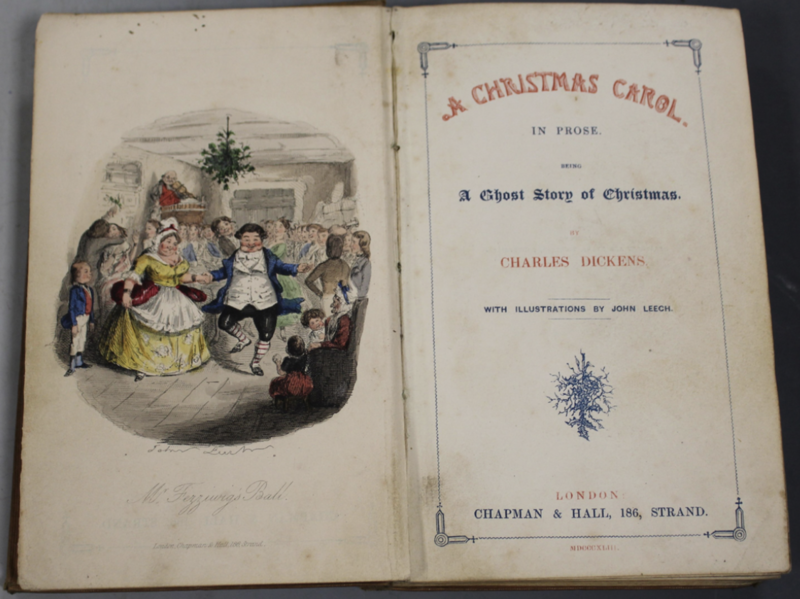 So it was in Compton Street, about a fifteen minute walk from William’s father Charles at Charing Cross, that William and Fanny Robb would have been living on the day that A Christmas Carol was published. The years following the publication of Dickens’ bestseller saw many changes in the lives of the Robb and Seager families. In 1844, John Robb married Mary Ann Downes in Lambeth and two years later they would have a son, who was christened Charles Edward Stuart Robb after his grandfather, but who died before his first birthday. At some stage Charles himself would himself move from Charing Cross to lodgings at 40 Tenison Street, off York Road in Lambeth, perhaps to be near his son. If anything, this accommodation was even more modest than Charles’ previous home at Charing Cross. The building was shared by four families, including those of a coppersmith and a portable water closet maker. I’ve often wondered why none of Charles’s children was able to accommodate him in his old age, particularly as his death certificate notes that he been suffering from ‘paralysis’ for six years – unless their circumstances were even more straitened than his own. In 1847 Charles’ son George William Robb, who by this time was living in Villiers Street, would die from influenza and bronchitis at the age of thirty-six. He was buried, like his mother, at St Martin-in-the-Fields. As for William and Fanny Robb, they would have two more children. In 1846, their daughter Matilda Fanny was born, while January 1851 saw the birth of my great grandfather Charles Edward Robb. Sadly, Fanny died four days after giving birth to him and was buried at Whitefield’s Tabernacle in Tottenham Court Road; she was thirty-six years old. 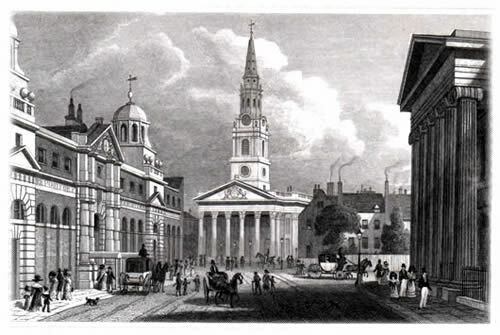 William had his infant son christened at the Methodist chapel in Great Queen Street, off Drury Lane, and by the time of the census in March of that year he and his older son William Henry had moved to Queen Street, Soho, while his two surviving daughters were staying with their Seager relations in nearby Gerrard Street. Over the next few years, three of Fanny Seager’s brothers would emigrate to New Zealand. 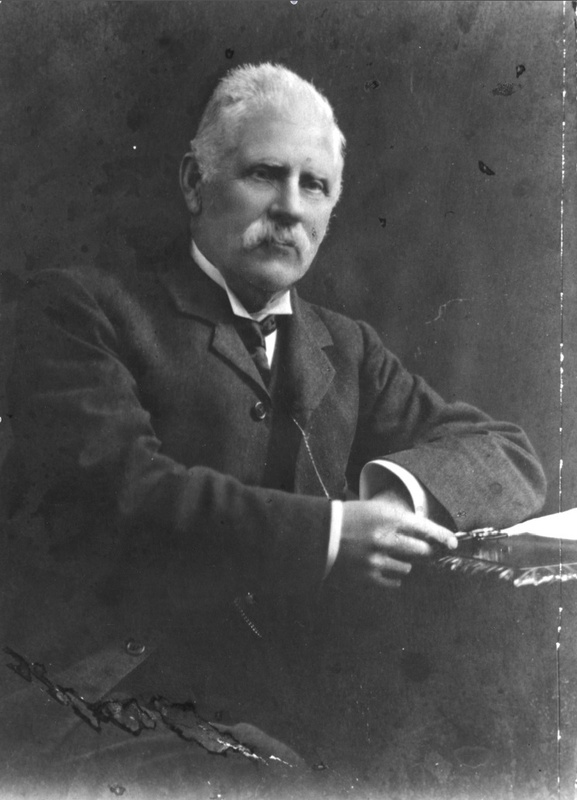 Edward, the grandfather of the aforementioned Ngaio Marsh, became a pioneer of mental health provision in his adopted country; Samuel junior was a carpenter and builder: his son and namesake would become a notable New Zealand architect and town planner; while Henry Fowle Seager worked as a printer and compositor. My great-great-great-grandfather Charles Edward Stuart Robb died in June 1853 at the age of 73. A year later, my great-great-grandfather William Robb married for a second time, to Marianne Mansfield Palmer, the daughter of a Methodist bookbinder from the Staffordshire Potteries. It seems likely that the couple met through attending the chapel in Great Queen Street. By 1855 they had moved out to Stepney, though to a rather more respectable district than the ‘squalid maze of streets, courts, and alleys of miserable houses let out in single rooms’ that Dickens found when he visited the area at around this time (see The Uncommercial Traveller). Here William and his new wife would produce an astonishing ten children in the space of twenty years. In time, William’s son Charles, my great-grandfather, would find employment as a caretaker at the Wesleyan Methodist Mission in Whitechapel, where my grandfather was born. The family later moved further eastwards, to East Ham, where my father was born – as was I. Thus the Robb family ceased to be dwellers in Dickens’ London, and became East Enders. My great grandfather Charles Edward Robb, born 1851 in Compton Street, Soho, died 1934 in Leytonstone. 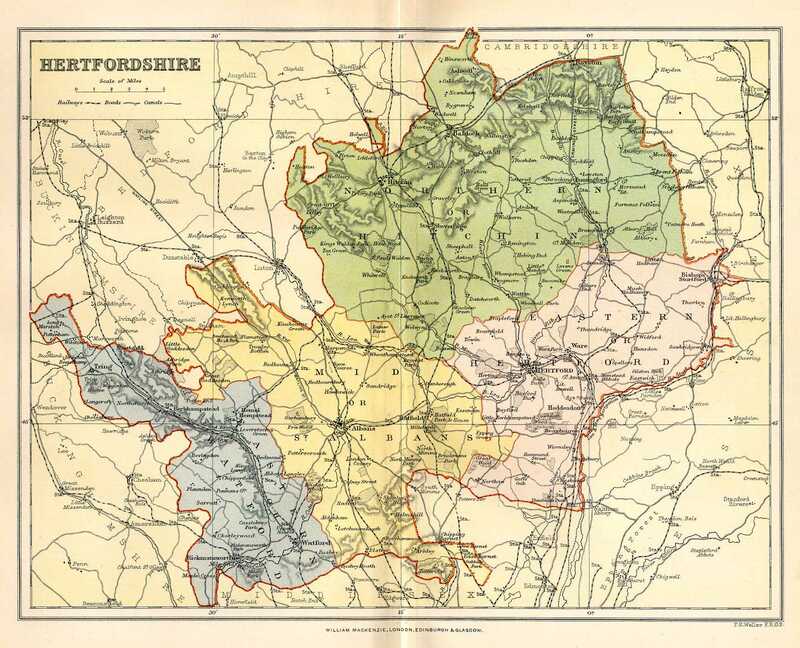 In my recent post about the origins of the Roe family, I reported on new information shared by my distant relative Keith Roe about Elizabeth Roe of Barkway, Hertfordshire. It seems likely that Elizabeth, who was born in the early 1790s, was related in some way to my 3rdgreat grandfather, Daniel Roe of Biggleswade, who died in 1838. Elizabeth Roe was married twice. In 1815 she married James King and they had three children – Richard, Henry and Elizabeth – before James’ death. This must have occurred before 1837, when Elizabeth married for a second time, to widower Lot Watson. At the time of the 1841 census Lot and Elizabeth Watson can be found living in Barkway High Street, with Lot’s two sons, Thomas and John, from his first marriage, and Elizabeth’s daughter Elizabeth from her first marriage. After 1841, the story becomes rather more problematic. If we search for Lot Watson in the 1851 census, we find someone who matches his details, still living in Barkway High Street with his sons Thomas and John, and describing himself as a widower – suggesting that his wife Elizabeth had died at some point in the previous ten years. Ten years later, in 1861, now aged 50, Lot is still describing himself as a widower, and still living in Barkway with his son Thomas, now 27, and the latter’s wife, Maria (they had married in 1856). However, Keith Roe has found convincing evidence that Elizabeth Watson, formerly King, née Roe, was actually still alive in 1851, and living in Luton, in the same street as her daughter Elizabeth King, who had married shoemaker George Hale in 1846, the record stating clearly that she was the daughter of James King and was born in Barkway. In the census records for 1851 and 1861, the older Elizabeth can be found living close to her daughter’s family, and in 1871 actually living with her daughter. Moreover, in all of these census records, Elizabeth describes herself as a widow. There seems little doubt that this is the same person who married first James King and then Lot Watson. In 1861, she gave her name as Elizabeth King, a widow aged 61, and was living alone in Park Lane, Luton, a few houses away from George and Elizabeth Hale and their family. Ten years later, Elizabeth King was still living in Park Lane, even closer to the expanding Hale family (though that may simply be a result of the order in which households were entered in the records). By the time of the 1871 census, Elizabeth Hale, née King, was herself a widow. Now aged 44, she was living in Elizabeth Street, Luton, with five of her children. Living with her was her mother, Elizabeth, who now gave her surname as Watson, and her age as 80. In an effort to get to the heart of this mystery, I’ve been attempting to trace the history of the Watson family of Barkway, and the trajectory of Lot’s life. Another connection between the Watson and Roe families arises from the fact that, at the time of the 1851 census, my 3rdgreat grandmother Eliza Sharp, formerly Roe, née Holdsworth, was working as a nursery servant for the Walbey family, who were farmers in the village of Nuthampstead, a couple of miles to the east of Barkway. Working alongside her as domestic servants were 20-year-old Emma Watson and 16-year-old Mary Watson, both from Barkway. I believe that Emma and Mary were sisters, and that they were the daughters of farm labourer George Watson and his wife Mary. Ten years earlier, the 1841 census record finds George and Mary living in the village of Newsells, just to the north of Barkway, with their children Charles, Elizabeth, Emma, Mary, George and Mark. The 1841 census was notoriously inaccurate in recording ages, but cross-checking with later, more reliable census data confirms that Charles was born in about 1827, Emma in about 1831, Mary in about 1835, George in about 1838, and Mark in 1840. George Watson senior was almost certainly the son of William and Eleanor Watson – and therefore the brother of Lot Watson who married Elizabeth King, née Roe, the record of their marriage stating that Lot was the son of William Watson. William Watson and Eleanor Taylor had married in Barkway on 19thDecember 1799. On 23rd June 1822 they had four children christened together: George, Mercy, Thomas and Lot. From other records, we can work out the approximate birth years of these children as follows: George, 1803; Mercy, 1803; Lot, 1811; Thomas, 1811. Mercy’s and Lot’s names suggest that the family might have been Nonconformists and this might explain the children’s delayed Church of England baptisms. George Watson must have married his wife Mary by about 1826. His sister Mercy married labourer William James in Royston on 1stNovember 1827. In 1841 they were living in Barkway Street, Royston, with their five children, and were still there ten years later. Mercy’s brother Thomas Watson is almost certainly the person of that name, said to be the son of William Watson, who married Elizabeth Phypers in Barkway on 12thOctober 1839. As for Lot Watson, he married for the first time on Christmas Eve, 1829, to Mary Hart, in Barkway. Lot and Mary Watson had two sons: Thomas was born in 1832 and John in 1835. Mary Watson must have died shortly after, perhaps as a result of John’s birth, since on 9th November 1837 we know that Lot married Elizabeth King, née Roe. The 1841 census claims that Lot was 30 and Elizabeth 40 at the time, which would mean they were born in 1811 and 1801 respectively. However, ages in that year’s census records were notoriously inaccurate, and later records suggests that Lot might have been born as early as 1809, and Elizabeth as early as 1793. Whatever their precise dates of birth, the difference of at least ten years between their ages, and the fact that they had both been widowed and would have no children together, suggest that their marriage might have been one of social and economic convenience, Elizabeth acting as a substitute mother for Lot’s two young sons. So how are we to explain that, thirteen years after their marriage, Lot and Elizabeth were not only living apart – but each claiming that the other had died? Not only that, but in 1869, Lot Watson would marry again, despite the fact that Elizabeth was apparently still alive. On 26thDecember 1869, Lot Watson, a widower working as a bricklayer, married Ellen Spicer, a widow, at Holy Trinity church, Haverstock Hill, in London. The witnesses were Thomas and Maria Watson – presumably Lot’s son and daughter-in-law. One might be tempted to dismiss this record as relating to a different, London-born Lot Watson (even though he is said to be the son of William Watson), but the census taken two years later finds Lot and Ellen Watson living in the latter’s home village of Great Hormead, five miles to the south of Barkway, with a number of Ellen’s children. They were still there ten years later, at the time of the 1881 census. By 1891, Lot Watson seems to have been widowed again, and, now aged 82 and a pauper, was living in the workhouse at Buntingford, five miles to the west of Great Hormead. He appears to have died seven years later in 1898. Is there a possibility that the Lot Watson who married Elizabeth King, née Roe, and the widower who married Ellen Spicer were actually two different people? The 1841 census is our only record, after their marriage in 1837, of Lot and Elizabeth Watson being together. That record suggests Lot was born in about 1811 and worked as an agricultural labourer. He already had two sons – Thomas, 8 and John, 6 – which enables us to match him with the Lot Watson who was previously married to Mary Hart. Were there any other men named Lot Watson living in the Barkway area at this time? The only one I can find is the 70-year-old man who in 1841 was living in Barkway High Street with Elizabeth Watson, aged 20, and one-year-old Ann Watson. He is probably the same man who married Mary Webb in Barkway in 1800. They had a son named Charles, a blacksmith like his father, who married a woman named Ann Childs and died in 1856. This Lot Watson, who must have been born in about 1772, seems to have died in 1844, the burial record describing him as a Congregationalist. 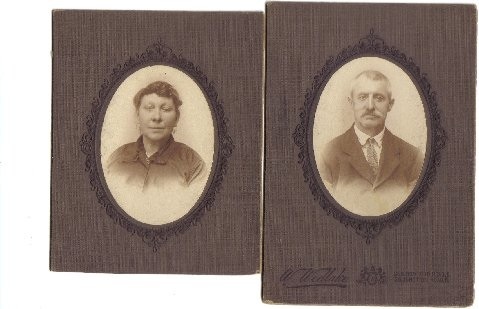 Some family trees at Ancestry claim that it was the older Lot Watson who married Elizabeth King, née Roe, in 1837, that she is the Elizabeth Watson to be found living with him in 1841, and that Ann was their daughter. But this seems extremely unlikely, given the disparity in their ages – 70 and 20 – even allowing for census inaccuracies, and the fact that this Elizabeth would have been only 16 at the time of her marriage in 1837, when we know that she was already a widow. The other 1841, which includes 14-year-old Elizabeth King, her daughter from her first marriage, matches what we know of Elizabeth King, née Roe’s details much more closely. Further research is needed to discover the origins of the older Lot Watson, and of the Elizabeth and Ann Watson living with him in 1841. My current theory is that he was a brother of the William Watson who was the father of ‘our’ Lot Watson, who may have been named after his uncle. 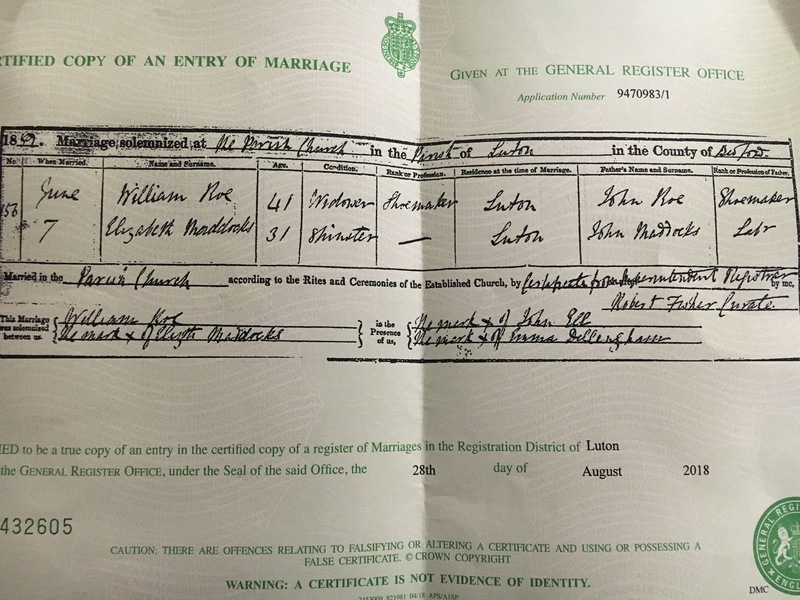 So if the Lot Watson who married Elizabeth King, née Roe, is the same man who later claimed to be a widower and then married Ellen Spicer, and if Elizabeth is the same woman who moved to Luton, all the time claiming to be a widow – how are we to explain this? We can only conclude that the couple separated after a few years of marriage, perhaps because they grew apart and divorce was not yet a legal possibility, or perhaps because, as already suggested, their marriage had only ever been one of convenience. It’s not as if this story is unique in my family’s history. 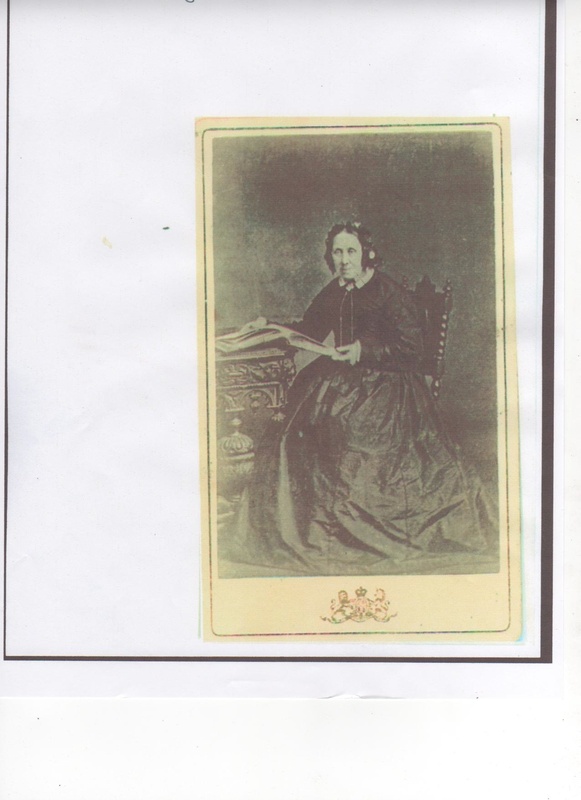 There are definite echoes of the story of Lot and Elizabeth Watson in the life of my 3rd great grandmother Eliza Sharp, formerly Roe, née Holdsworth. Following her second marriage to John Sharp in 1845, there is little evidence that the couple ever lived together. 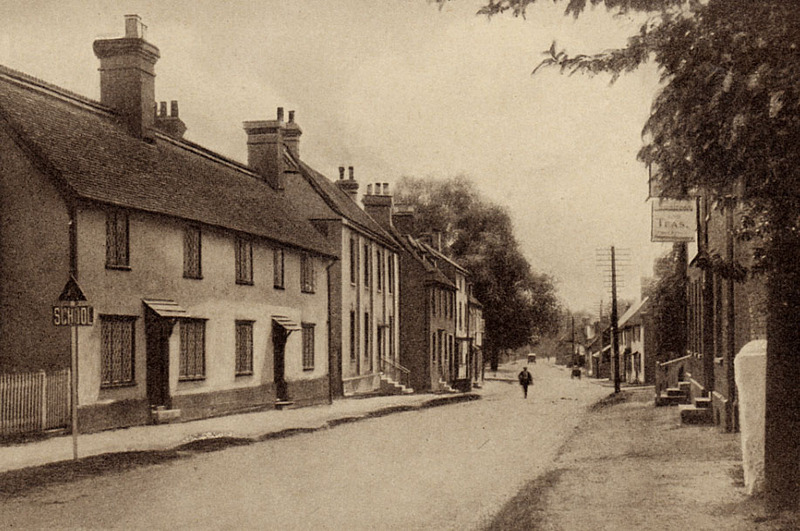 In 1851, John was living alone in Barkway High Street, while Eliza was living with and working for the Walbey family in Nuthampstead. I haven’t managed to find John Sharp in the 1861 census, but Eliza was again away from home, working for Rev. Robert Merry and his family in Guilden Morden, just across the county border in Cambridgeshire. She would still be with Rev. Merry’s widow and her family in Devon ten years later, though, she had now reverted to her previous married name of Roe (just as Elizabeth Watson reverted to her former surname of King in 1851 and 1861). This was despite the fact that her husband John Sharp was still alive and, in another echo of Lot Watson’s experience, was languishing in the workhouse in Bassingbourn. As for Lot Watson’s apparent bigamy – marrying for a third time to Ellen Spicer while his wife Elizabeth was still alive – this is not unprecedented either. I’ve written elsewhere about my theory that my 3rd great aunt on my father’s side of the family, Elizabeth Robb, may have married a bigamist when she wed dentist Joseph Woolley Boden in 1841, and indeed that she may have later committed bigamy herself with piano teacher Edmund Vineer. Apparently these things were not uncommon at a time when divorce was next to impossible for those without means or social status. Perhaps the fact that Elizabeth had moved to Luton – thirty miles away in another county – made it easier for Lot to pass himself off as a widower (and she as a widow), while setting up home with his third wife Ellen in her home village of Great Hormead prevented them becoming the subject of gossip in his home town of Barkway. I wrote recently about new evidence connecting my Roe ancestors with the part of England where I now live. My distant relative Keith Roe has found a Roe family living in the village of Pirton, just a few miles from Hitchin where I’m writing this, who may have been related to my 3rdgreat grandfather Daniel Roe (d. 1838), a Baptist shoemaker in Biggleswade, ten miles further north. As I noted in my earlier post, I was particularly intrigued by Keith’s discovery of a shoemaker named John Roe who served his apprenticeship here in Hitchin in the 1780s, and was married in the town twice, firstly in 1788 and secondly in 1792. It’s almost certain that he is the same John Roe who was paying land tax on property in nearby Luton in the 1820s. Whether this John Roe was related in some way to the Roes of Pirton is as yet unproven. However, we know that William and Martha Roe of Pirton had two sons, named John and Daniel, who were both still alive when Martha made her will in 1817. We don’t have records of the births or baptisms of these children, perhaps because the family were Dissenters. We also lack records for any children born to John Roe of Luton, possibly for the same reason. However, we do know that there would be Roes living in Luton later in the 19thcentury. I’ve written before about William and Peter Roe, who may have been brothers, and whose families can be found in the census records for Luton from 1841 onwards. There are some circumstantial factors pointing to a link with both John Roe and the Roes of Pirton – William and Peter were both shoemakers; William could have been named after William Roe of Pirton (his grandfather?) and Peter after Peter Moss, the father of Martha Roe of Pirton (his great grandfather? ); and we know that William of Luton named two of his sons John and Daniel. I’ve now obtained a piece of evidence that may provide a more well-founded link between these later Roes in Luton and John Roe, the shoemaker who served his apprenticeship in Hitchin in the 1780s. Marriage certificates usually include the names of each party’s fathers, so they can be useful tools for tracing an individual’s family origins. Official registration of births, marriages and deaths only began in 1837, which means that for events before that date we have to rely on the parish registers. Peter Roe married his wife Dinah Scrivener in 1827, and William Roe his wife Sarah Huckle in 1831, so certificates aren’t available for those events. However, I remembered that William married his second wife, Elizabeth Maddocks, in 1852, so I applied to the General Register Office for the certificate. My copy arrived yesterday, and it clearly states that William Roe, a 41-year-old shoemaker and widower of Luton, was the son of John Roe, also a shoemaker. Now, there might have been more than one John Roe working as a shoemaker in Luton in 1811 or thereabouts, when William Roe was born. But it’s certainly possible that William’s father was the man who served his apprenticeship in Hitchin in the 1780s. At the same time, my distant Australian relative Julie Campbell, who is descended from Richard John Roe, one of the sons of my 3rdgreat grandfather Daniel Roe of Biggleswade, tells me that she has learned of DNA matches with two people who have William Roe of Luton in their family trees. This is a guest post by John Lehman of the Coats of Arms Database website. In London in the 16th and 17th centuries basically the levels of society were commoners, gentleman, knights, baronet, baron, viscount, earl (count), duke, prince, and king or queen. The main focus here is the titles of Knight and above. We will first discuss what the titles represent and then look at a few of the title holders from London between 1600-1700. Gentleman – A Gentleman was a distinguished man that received his income from property, that was inherited or from another source. Otherwise they were wealthy and did not need to work. They could not claim nobility of any kind including the rank of an Esquire. Esquire – An Esquire was originally called a Squire. They were the assistant to a Knight (someone who held a shield), or the eldest son of a Knight. Knight– A knight was given the honour in recognition of merit or service. Knights are allowed to use Sir in front of their name. During the Middle Ages a Knight was a mounted soldier in armour that fought for the Crown. Baronet / Baronetess– A baronet is given to a commoner, and unique in nature. It can be passed down as a hereditary honor but they are not allowed to a have a seat in Parliament. It is also not considered an order of knighthood but it does rank above Knights. The only knightly orders it does not is the Order of the Garter and the Order of the Thistle. This title was created by James I of England as a means of raising funds. The female title of this rank is a baronetess but it is very rare as there have only ever been four in history. Baron / Baroness– This title was granted directly from the King or Queen, usually for their loyalty to the crown. Originally anyone who was given land by the King / Queen for military service was considered a Baron no matter what their other title may have been. This rank was discontinued in England when King Edward I recognized the dangers it posed to the monarchy structurally and financially. Viscount / Viscountess– Viscounts in history were originally what was considered a Sheriff and was appointed by the ruling monarch of the kingdom. Although today this title is very much hereditary and is given to an heir of a Marquess or Count. Their responsibility was for an area known as a viscounty, viscountship or viscountcy which was their jurisdiction to watch over and enforce the kingdom’s laws. Earl (Count) / Countess– An Earl or County was a honorary title given by the monarch for services to the King / Queen, it could also be given to someone with no estate. The Counts / Earls that were given lands by the monarch were given a small area of the kingdom called a county or countship. This was not a hereditary title but the Earl/Counts with larger estates could occasionally pass the land to their son’s. Marquess / Marchioness – A Marquess was the ruler over land called a mark or march. They were responsible for the defense of any border lands of the kingdom and usually had more men that they commanded at arms than other nobles. Duke / Duchess – A Duke is usually a relative of a King’s or Queen’s family. Their lands are called a duchy. They hold some responsibilities within the kingdom. Prince / princess – A Prince is usually a son or member of the King’s or Queen’s family. It is a title that is hereditary and is given to Europe’s highest nobility. King / queen – A King / Queen is the second highest title within the sovereign nations and the only title that ever out ranks them is the Emperor. They are the head of state and rule over an entire kingdom or realm. BARTHOLOMEW GRACEDIEU– 1697, Nov. (Oct.) 17. BARTHOLOMEW GRACEDIEU, of London, salter, sheriff of London. He was the 3rd son of Thomas Gracedieu of St. Botolph Bishopsgate, he married Frances and had two daughters. One of them died without having children. He was knighted by the King on November 17, 1697 when he presented the London Address on the Peace, at Kensington. He started an apprenticeship with Thomas Collet who was a salter and a member of the Vinters’ Company. His father died in 1679 and he and his brother Daniel inherited London property. At this time he became a freeman. Starting in 1686 he was trading with Jamaica, and he was counsel for Jamaica after the Revolution to remit funds to London and eventually became an agent for the colony around 1693. He died in 1715. EDMUND HARRISON– 1698, Dec. 14. EDMUND HARRISON, of London, merchant, a director of the New East India Company – Joseph Brooksbank, of Healaugh, born 1725 ; married to Elizabeth, daughter and co-heiress of Benjamin Bond, of London, and died 1759. His widow married William Snell, a Director of the Bank of England, and of Hon. East India Company, son of William Snell, by his wife Cecilia, daughter and co-heiress of Sir Edmund Harrison, Knight by his wife Mary Fiennes, niece of Viscount Saye and Sele. Mr. Brooksbank left (with a daughter Catherine, to. Thomas Page, of Poynters, Surrey) an only surviving son. OWEN BUCKINGHAM was born approx. 1649 the son of George Buckingham an innkeeper of Stanwell, Middlesex. He was an English merchant, alderman, MP, Lord Mayor of London and Sheriff of London. He was knighted in 1695, Oct. 14, upon congratulating the King on his safe return and success. By the time he was 40 he had become involved in politics and was a common councilman for London and then became an Alderman from 1696 to his death. He was appointed the Sheriff of London for 1695-96, was knighted the same year and elected the Lord Mayor of London for 1704-05.. From a promise to manufacture sailcloth in the town that he was elected MP for reading in 1698 and then again in 1701, 1702, and 1705. He only resigned his seat in favor of his son, Owen Buckingham. He was married 6 times and became quite wealthy and was able to purchase the Fettiplace family estates near Reagin in 1706. He died in 1713 and was survived by his only son and heir Owen and two daughters from his first marriage. HENRY FURNESE– Henry Furnese was born May 30, 1658 the son of Henry Furnese of Sandwich Kent and pursued a career in the City of London as a merchant trader. He was a member of Draper’s Company and was knighted on October 21, 1691 at the Hague, on a Sunday for carrying the news of the defeat of the Irish at Limerick. He was one of the original directors of the Bank of England when the bank was founded in 1694. He was also a director of the New East India Company from 1698 to 1703. 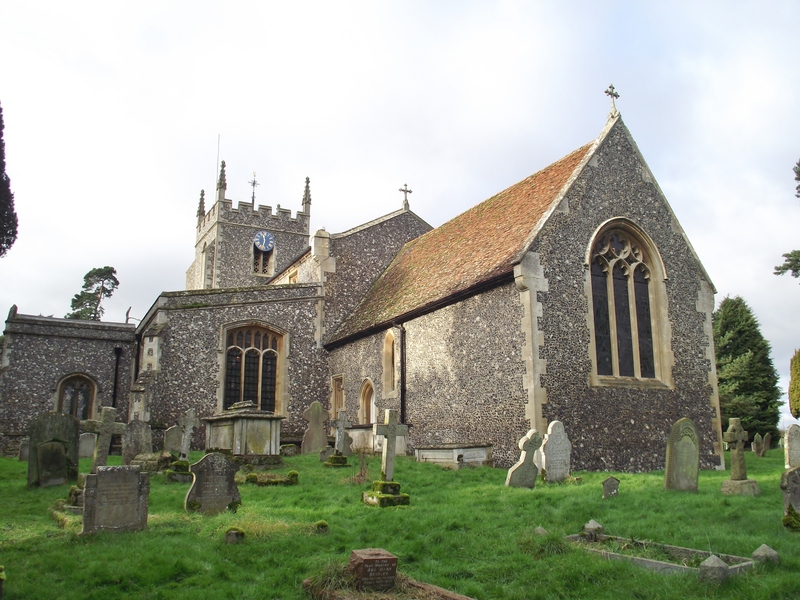 He was a Member of Parliament for Bramber in 1698 and was expelled on February 14, 1700. Then re-elected for Sandwich in 1701 but was again expelled the following month, only to be re-elected again, after which he held the seat until his death. He was the Sheriff of London 1700-01, and was created a baronet on 27 June 1707. In 1711 he was selected an Alderman for the City of London. He was married twice first to Anne Brough in 1684 who was the daughter of linen draper Robert Brough of St. Lawrence Jewry. He was married second to Matilda who was the daughter of fellow London merchant Sir Thomas Vernon. He died November 30, 1712 and was succeeded by his son Robert. The other day I shared some new information about links between my Roe ancestors and the Evans family. My fellow researcher and distant relative Keith Roe has discovered that Rev. David Evans, who was the Baptist minister of Biggleswade in the late eighteenth century, was married to Mary Moss. She seems to have been the sister of Martha Moss, the wife of William Roe of Pirton, Hertfordshire, and indeed Mary Evans seems to have lived in Pirton after her husband’s death in 1786. There is reason to believe that William Roe of Pirton may have been related in some way to my 3rd great grandfather Daniel Roe, a Baptist shoemaker in Biggleswade. There is also a connection of some kind between Daniel’s wife Eliza Holdsworth, my 3rd great grandmother, and the Evans family. Her mother was Lydia Evans and her grandfather Francis Evans, though little is known as yet about their origins. When Daniel and Eliza were married at Blunham in 1825, one of the two witnesses was Mary Evans, and there is reason to believe that she was the daughter of Biggleswade maltster and Baptist lay preacher Caleb Evans. Daniel and Eliza would name one of their sons Caleb. What do we know about Rev. David Evans and his wife Mary? From Baptist sources, we know that David was born in Mydffai, Camarthenshire, Wales. He he was said to be 76 years old when he died in 1786, meaning that he was born in about 1710. He was baptised as an adult in 1734 and began preaching in 1736. His first posting was in Hook Norton, Oxfordshire, after which he went to Ireland, and thence to Newport Pagnell. Some sources give his next and final posting as Biggleswade, while others mention an intermediary posting in nearby Maulden, and others a move in 1749 to Great Gransden in Huntingdonshire, where he was said to be ‘a very acceptable minister’. All sources agree that it was in 1751 that Evans was appointed as minister of the Baptist congregation in Biggleswade. 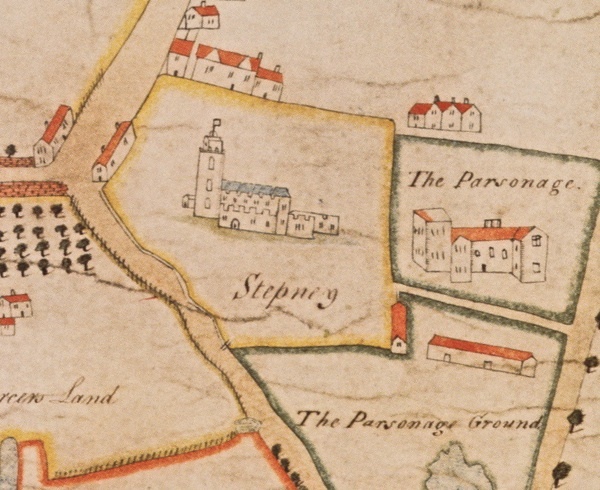 According to Keith Roe’s research, it was on 15th October 1751 that David Evans married Mary Moss in Potton, a few miles to the north of Biggleswade. David would have been about forty years old, but Mary was not quite nineteen, having been born in 1732, the daughter of Peter Moss and his wife Mary Ingoldsby. She had a brother Thomas who would marry Mary Daly in Ickleford, Hertfordshire, in 1761, and her sister Martha would marry William Roe at Arlesey, Bedfordshire, in 1767. We don’t know whether David and Mary Evans had any children – certainly none are mentioned in Mary’s will of 1806 – or whether there was any connection to Caleb Evans of Biggleswade, who was born in about 1780 and died in 1842. 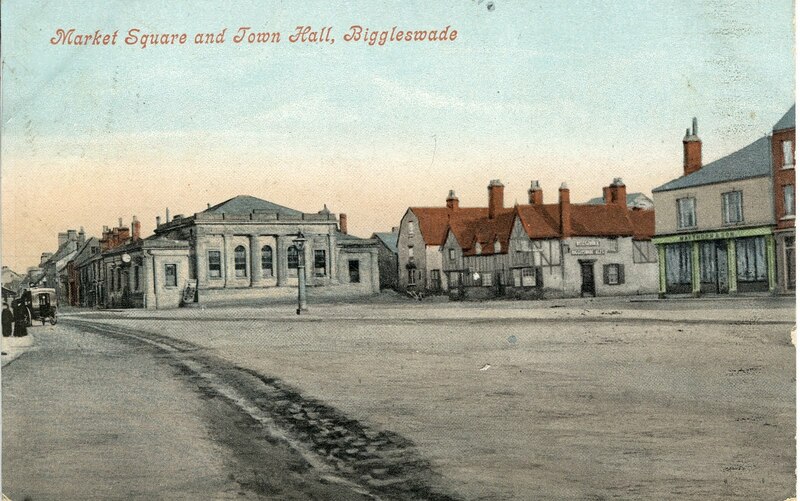 June the 16th, I was alarmed with the report of a terrible fire at Biggleswade. I went upon the Windmill hill near Hitchin and from thence could see columns of smoke ascend up like clouds, though the fire was eleven miles off. On the 20th, I went to Biggleswade, and saw somewhat of the dreadful effects of this fire. It was an awful sight indeed. There were more than one hundred dwelling houses quite destroyed, and about twenty more that were destroyed, to a greater or less degree. There were seventy-nine poor families who were quite burned out. Several maltings were destroyed, and the Dissenting Meeting house, in which I had repeatedly preached, and in which good old Mr. David Evans had preached for many years, was quite destroyed. There was not anything belonging to the Meeting House …but was burned. There were few, if any persons of property, in the town but what were affected by this calamity, more or less, though some were affected much more than others. Mr. Herbert, merchant, was deeply affected, as to loss of property of different kinds. Mr. Foster suffered considerably, but he suffered but little compared with Mr. Herbert, and compared with what he was in imminent danger of suffering. Yet there was mercy mingled along with affliction, in this case. I do not recollect that there was any life lost, whereas there was one, if no more lost at the Potton fire in 1783. February the 7th . On this day, I went to Biggleswade, and attended the funeral of good old Mr. David Evans. He was arrested, January the 27th, with a paralytic stroke, and died February the 2nd aged 76 years. He was this day buried in the meeting house, and great respect was shown him at his funeral. By his own desire, Mr. Mayle of Blunham preached his funeral sermon, from 2 Cor. 1:12 “For our rejoicing in this, the testimony of our conscience, that in simplicity and godly sincerity, not with fleshly wisdom, but by the grace of God, we have had our conversation in the world, and more abundantly to you-wards”. There was a great number of people attended his funeral. It was calculated the number amounted to 800. Mr. Bowers, who then preached at Biggleswade, prayed before the sermon. He was not put into the grave till after the sermon, and I then spake over the grave. Mr. Evans had not been capable of preaching for some time before his death. He had lived at Biggleswade more than 30 years. He had labored under great discouragements there, as to apparent non-success. He once told Mr. Foster Senr. of Cambridge, when he went to supply Mr. Robinson’s congregation there, that he did not know that he had been instrumental for the conversion of one soul by all his preaching at Biggleswade. If he did not know of any such circumstance either at that time, or afterwards, I came to the knowledge of such a circumstance, after he was dead, in conversing with a man, who, I hope was a truly serious character and who attributed his first serious impression to a sermon that he heard at Biggleswade, and, I understood, preached by Mr. Evans, to whom he never made himself known. His general character and conduct, however, were highly exemplary. The celebrated Mr. George Whitefield, with all his popularity and success, did not leave behind him a more respectable character than good old Mr. Evans did, with all his apparent comparative want of ministerial success. Though he was but little attended on, in the exercise of his ministry, he was highly esteemed by the town and neighbourhood in general. When he walked in the street, the very children were emulous to show, in their way, their respect for his character. Mr. Kirkby, one of his congregation, once related to me a peculiar anecdote, which bespoke the high estimation in which the general character of Mr. Evans was held. Mr. Kirkby, soon after he was settled in the neighbourhood of Biggleswade, as a farmer, to which he had removed out of Leicestershire, was at public dinner at Baldock, I presume, at one of the fairs held there. Somehow or other, the conversation at table took a turn, that led one of the company to speak about Biggleswade, who knew nothing of Mr. Kirkby, nor that he had anything to do with Biggleswade, much less that he had any connection with Mr. Evans, and whom perhaps, somebody or other of Biggleswade, had some way or other lately displeased. He spake about Biggleswade, somewhat to the following purport. “Biggleswade is a comical sort of place. I do not know that there is above one honest man there. I do believe there is one. The old Presbyterian parson is, I believe, an honest man. 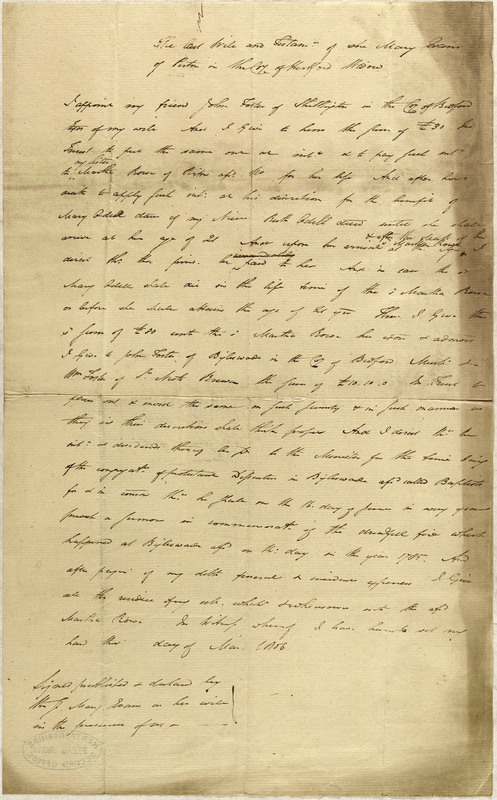 I do not know that there is any other there.” Now, though, I trust the man was far enough from being right in his opinion, relative to other people, yet what he said bore an exceedingly honorable testimony to the character of Mr. Evans, whom, it appeared, he meant, by the old Presbyterian parson, and this coming from one who was far enough, I presume, from being a Presbyterian himself, and who, perhaps, knew nothing or next to nothing of Mr. Evans, except what he had derived from general report concerning him, spoke so much the more forcibly in honor of Mr. Evans. And I direct that the interest and dividends thereof be paid to the Minister for the time being of the congregation of protestant dissenters of Bigleswade aforesaid called Baptists for and in consideration that he shall on the sixteenth day of June in every year preach a sermon in commemoration of the dreadful fire which happened at Bigleswade aforesaid on that day in the year one thousand seven hundred and eighty five. The new information that I shared in the last post – about the origins of the Roe family, and their possible connection with Hitchin, where we now live – has made me want to make absolutely sure that I’m descended from this family. I took an Ancestry DNA test some time ago, but to date I’ve been disappointed by the small number of matches with people in this branch of my family tree. So today I went back to the records, in an effort to confirm that I’m on the right track when it comes to the Roes. As mentioned before, I’m descended from the Roe family via my mother. She was born Joyce Alma Londors on 27thJuly 1933 in East Ham, which was then in Essex and is now part of the London borough of Newham. The England and Wales Birth Index gives her mother’s – my grandmother’s – name as Roe. 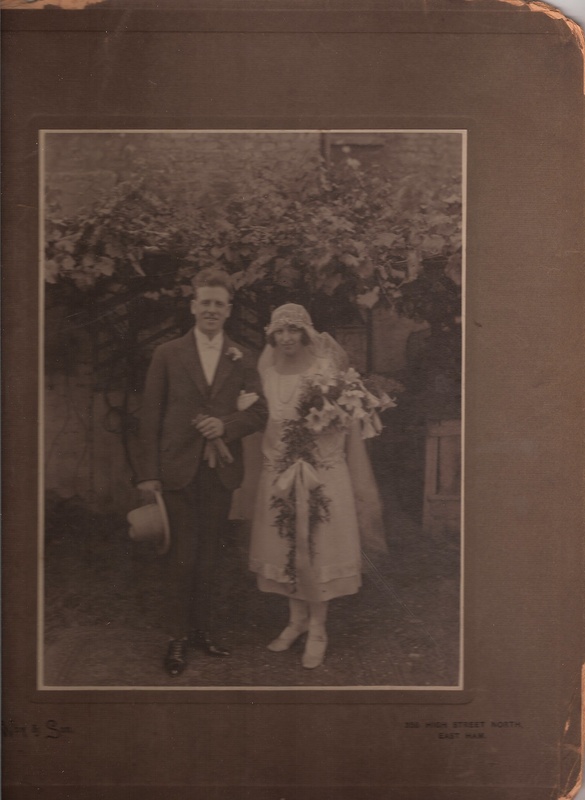 My grandparents were married at St Alban’s church, Upton Park, on 2ndAugust 1925. My grandfather, George John Londors, then aged 28, was described as a labourer, the son of another George Londors, a grave digger. My grandmother – my ‘Nan’ – was then aged 23 and working as a machinist. The marriage record states that she was the daughter of Joseph Priestley Roe, a sewerman. The 1939 England and Wales Register, which was recently made available online, has the Londors family living at 24 Oakfield Road, East Ham (the house where my Nan would spend the rest of her life). George J Londors, born on 14thDecember 1896, is now described as a ‘grave digger – heavy work’ and his wife Minnie L Londors, born on 20thApril 1902, as undertaking ‘unpaid domestic duties’. At the same address are Joseph P Roe, born on 22ndJune 1862, and described as a ‘sewerman – retired’, and Eliza Roe, born on 29thAugust 1863, also undertaking ‘unpaid domestic duties’: they were my great grandparents. 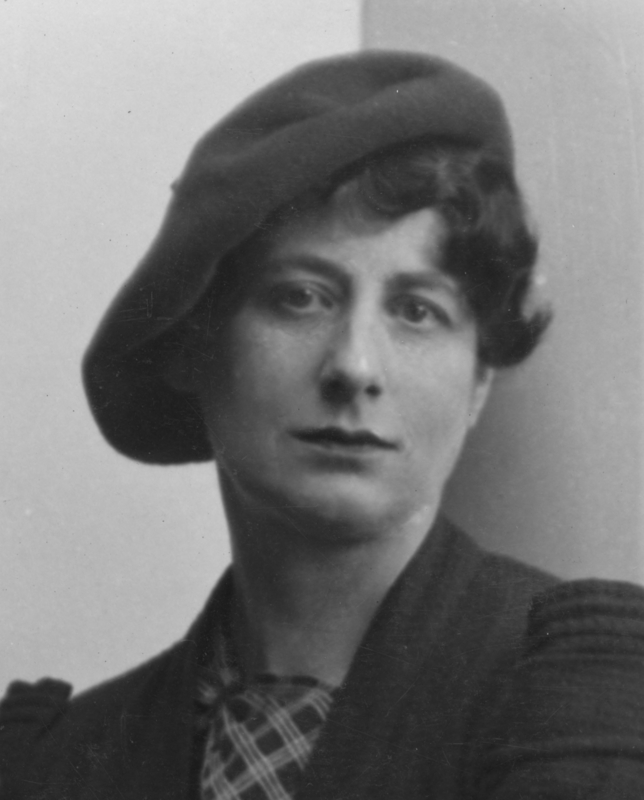 Minnie Louisa Roe was born in 1902 at 85 Oakfield Road, East Ham, the daughter of Joseph Roe, a general labourer, and his wife Eliza Roe, née Bailey. At the time of the 1911 census, Minnie, then aged eight, was living at 92 Oakfield Road, East Ham, where she was described as the daughter of general labourer Joseph Roe, aged 48, and Eliza Roe, 47, together with her older siblings Richard, Flora, Elizabeth, William and John. Her father Joseph is said to have been born in the ‘parish of St James, W’ (Westminster?). Since the census was taken in April 1911, his age is consistent with him having been born in June 1862. The same family can be found living at 313 Barking Road, East Ham, in 1901, a year before Minnie’s birth. There is enough overlap in the children’s names as well as their dates of birth, to enable us to conclude that this is the same family. Joseph’s full name – Joseph Priestley Roe – is also given, and his age is said to be 38. His place of birth is given as ‘England, place not known’: perhaps he was not at home when the enumerator called? Ellis – the middle name of Joseph and Eliza’s son Walter – is a clue as to Joseph’s family origins: it was also the middle name of the man I believe to have been Joseph’s brother, Daniel Ellis Roe. (I’ve written before about the close, and somewhat mysterious links, between the Roe, Blanch and Ellis families.) In 1891 Joseph Roe and his family had been living at Denmark Terrace, East Ham, next door to Eliza’s parents, William and Elizabeth Bailey. Joseph, a dock labourer, was said to be twenty-nine years old and born in ‘London St James’, thus confirming a connection with the Joseph of the 1911 census. Joseph Priestley Roe married Eliza Bailey at the church of St Anne, Limehouse, on 25thNovember 1883. Joseph, then working as a carman, is described in the parish register as the son of Daniel Roe, a shoemaker. One of the witnesses was Flora Blanch, another clue as to Joseph’s family origins: if my theory is correct, Joseph’s mother was Mary Ann Roe, née Blanch, and Flora was almost certainly Joseph’s cousin of that name. If we look for records of Joseph before his marriage, we find a census record in 1881 for nineteen-year-old Joseph Roe, a butcher’s assistant born in ‘Middlesex, Westminster’, living at 3 Grange Road, West Ham, and described as the nephew (and presumably employee) of butcher Walter Trader and his wife Emma. 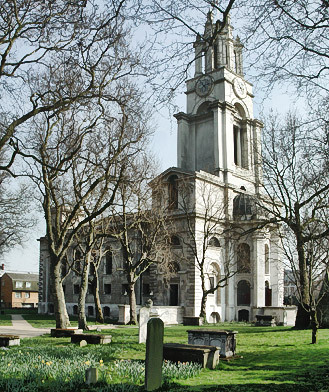 The couple had been married at St Anne’s church, Limehouse in 1869. We know from their marriage record that Emma Louise Trader, née Blanch, was the daughter of shoemaker John Blanch, who was also the father of the Mary Ann Roe, née Blanch, who I believe to have been Joseph Roe’s mother; in fact, Mary Ann was one of the witnesses to the marriage. Searching for Joseph at the time of the 1871 census, we find the most likely candidate in eight-year-old ‘scholar’ Joseph Roe, to be found living with another uncle and aunt in Albany Road, Camberwell. He is said to have been born in ‘Middlesex, Haymarket’. His uncle is Thomas Parker and his aunt is Eliza Parker, née Roe; the couple had been married in 1853. Eliza was the sister of Daniel Roe, who I believe to have been Joseph’s father. Crucially, the 1871 census record notes that Eliza was born in Biggleswade, Bedfordshire, in about 1831: the first evidence we have of Joseph Roe’s connection to the Roe family of that town. 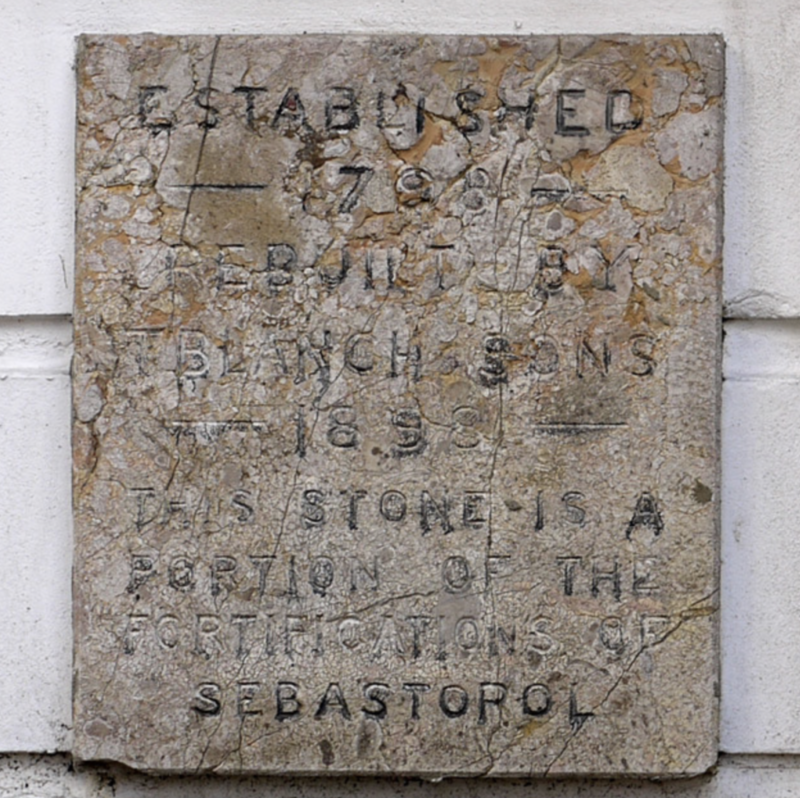 The final link in the chain connecting my great grandfather Joseph to this branch of the Roe family is provided by the official record of his birth, which took place at 23 Great Windmill Street, in the sub-district of Berwick Street, in the registration district of St James, Westminster. His mother is said to be Mary Ann Roe, ‘formerly Blanch’, while his father, who was responsible for registering the birth, was Daniel Roe, a ‘bootmaker master’. The only disparity is in the date of Joseph’s birth, which is given here as 27thJuly 1862, whereas later records claim that he was born on 22nd June in that year. Perhaps this can be explained by the fact that Joseph’s mother, and probably his father, died when he was very young, and that he was brought up, as we have seen, by various aunts and uncles, who may not have had access to his birth records. Interestingly, Joseph wasn’t christened until 6thJuly 1870, at St Luke’s, a chapel of ease within the parish of St James, Westminster. There is plenty of evidence to confirm that Joseph Priestley Roe’s father – my great great grandfather – Daniel Roe, was the son of Biggleswade Baptist shoemaker Daniel Roe senior and his wife Eliza Roe, née Holdsworth. As I noted in the last post, when Eliza returned to London with her children in the 1840s, after her husband Daniel’s death, her son Daniel junior married Mary Ann Blanch, who was actually his second cousin. Mary Ann’s mother Keziah Blanch, née Holdsworth, was the first cousin of Daniel’s mother Eliza. In fact, I have reason to believe that Daniel may have been apprenticed to his future father-in-law, shoemaker John Blanch. Joseph’s mother Mary Ann Roe, née Blanch, would die of consumption in 1870, and since we have no further records for his father Daniel after that date, we must assume that he probably died around the same time. Now that I’ve convinced myself of the connection between my immediate Roe forebears and the Baptist Roes of Biggleswade, I can return with confidence to exploring the origins of the family. 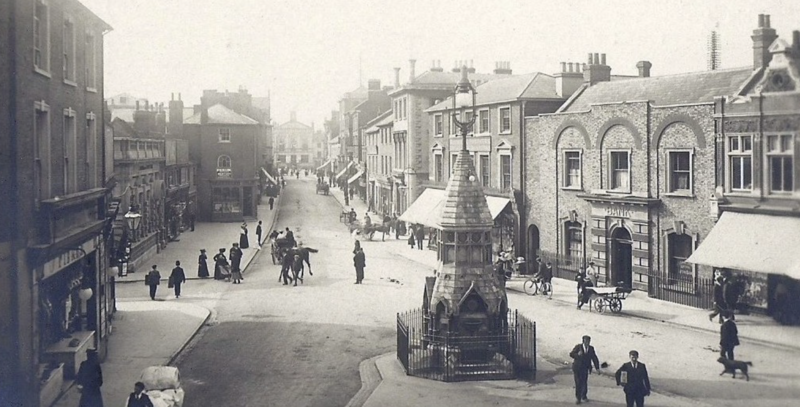 When we moved to Hitchin twenty years ago I had no idea that there was an ancestral connection to the area. It was a revelation to discover that a branch of my mother’s family that I’d always associated with the East End of London – the Roes – had once lived in places like Biggleswade and Barkway, a dozen or so miles from here. Now, new information provided by Keith Roe, a fellow researcher and distant relative, has uncovered evidence that some of my forebears may have lived even closer to where I’m writing this – in Hitchin itself. First, a reminder of my what we already know about the Roe family. My maternal grandmother – my ‘Nan’ – was born Minnie Louisa Roe in East Ham, London, in 1902. She was the daughter of labourer Joseph Priestley Roe and his wife Eliza Bailey. Joseph had been born in Great Windmill Street, Soho, in 1862, the son of shoemaker Daniel Roe, and Mary Ann Blanch. Daniel was born in Biggleswade, Bedfordshire, in 1829. His father was another Daniel Roe, also a shoemaker, and his mother was Eliza Holdsworth: they were married in nearby Blunham in 1825. Born in 1801, Eliza Holdsworth was the daughter of Whitechapel shoemaker William Holdsworth. We know a good deal about the Holdsworths and their origins: William was the son of Yorkshire-born farmer Joseph Holdsworth and his wife Elizabeth Gibson, who was descended from the Greene family of Stepney and the Bynes of Sussex, all of whom I’ve written about extensively on this and other blogs. But until now we’ve known very little about the origins of Eliza’s husband, Daniel Roe senior. 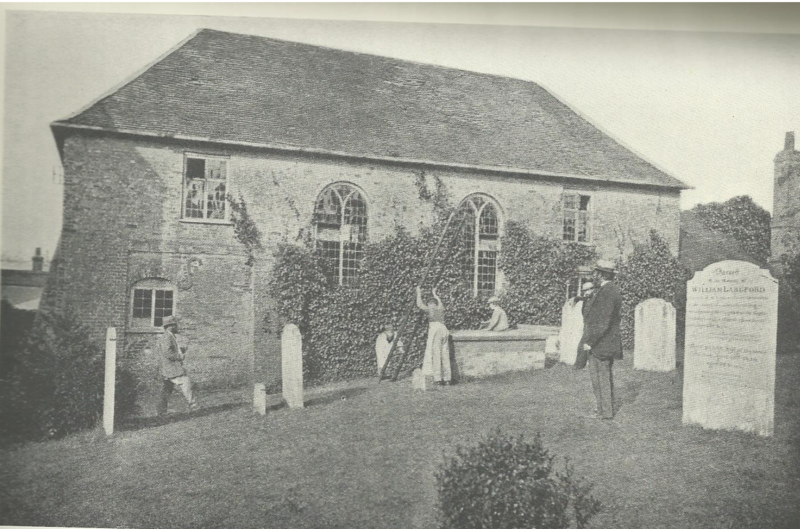 We knew that he was a Baptist, like Eliza’s parents, and that there was a possible connection with Martha and Elizabeth Roe who lived in the village of Barkway, in the northeastern corner of Hertfordshire. But as to when and where Daniel was born, or who his parents were: until now, we’ve only been able to speculate. Daniel Roe and Eliza Holdsworth had five children together, before Daniel’s death in 1838. Their daughter Anna Maria died young, and Eliza and her other children all left Biggleswade in the early 1840s. One son, Richard, was apprenticed as a carpenter in Layston, not far from Barkway; he married a local girl and they eventually emigrated to Australia. The other three Roe children – Daniel junior, Caleb and Eliza junior – would all eventually move to the East End of London, where their mother had been born. Eliza also returned to London, but only briefly. In 1845 she married for a second time, to John Sharp, a carpenter from Barkway, where she returned with him. Like Eliza, John Sharp had recently been widowed. His first wife was Martha Roe, whom he had married in Barkway in 1821; they had a daughter, Elizabeth, who died at the age of two. John and Martha can be found in the 1841 census living in Barkway High Street. The records state that Martha died of consumption on 24th May 1845. It seems likely that Martha was a close relative of Eliza’s late husband, Daniel – perhaps his sister, or maybe a cousin? Perhaps the marriage between John and Eliza was simply a way of John providing social and economic security for his widowed sister-in-law. Eliza would spend the remainder of her life working as a domestic servant for various families in villages along the borders of Hertfordshire, Bedfordshire and Cambridgeshire. It would seem logical that if the Martha Roe who married John Sharp was related to Daniel Roe senior, then so was the Elizabeth Roe who in 1815 had married James King, also in Barkway, particularly as James was a witness to Martha’s marriage to John Sharp in 1821. Perhaps she was Martha’s sister? James and Elizabeth King would have three children together – Richard in 1816, Henry John in 1824 and Elizabeth Kimpton in 1826 – before James’ early death in the same year. In 1837 Elizabeth King, née Roe, married for a second time, also in Barkway, to farm labourer Lot Watson, who had also been married before. The record of Elizabeth’s marriage to Lot Watson gives her father’s name as John Roe. Previously, it was thought that this was the man who married Hannah Role in Layston in 1795, but the new evidence uncovered by Keith Roe has opened up other possibilities. Keith has followed Elizabeth Kimpton King – Elizabeth Watson née Roe’s daughter from her first marriage – through the records, and found that she married a man named George Hale, at St Mary’s church, Luton, in 1846. The 1851 census finds them living at 26 Park Lane, Luton, with their three-year-old daughter Martha and three-month-old son Henry. George, who was born in St Albans, worked as a shoemaker and Elizabeth as a straw bonnet sewer. The record clearly states that Elizabeth was born in Barkway, Hertfordshire, in 1827 or thereabouts. Further confirmation that this is the right person is provided by the fact that 33 Park Lane, just a few doors away from the Hales’ home, is occupied by one Elizabeth King, a widow of 61, also a straw bonnet sewer, who is almost certainly Elizabeth’s mother. In 1861 both the Hales and Elizabeth King are still living in the same street. By 1871, Elizabeth Hale is a widow and living with her children in Elizabeth Street, Luton. Elizabeth’s mother, now using her later married name of Watson, is living with them. She seems to have died in 1875; her daughter Elizabeth Hale, née King, would live until 1899. Interestingly, the census records for Elizabeth Watson, formerly King, née Roe, describe her as having been born in Luton. This led Keith Roe, in his quest for Elizabeth and Martha Roe’s origins, to search for a John Roe who either had been born or had lived in Luton. As I’ve found before, there were a number of Roe families in Luton and the surrounding villages at this time, but Keith has come across a likely candidate in a John Roe who was active in the town between 1819 and 1832, when land tax records show him to have been a tenant of one James Rushmore, who is listed as a master cordwainer in the Luton Apprentice Indentures. This is where, for me, the story gets really interesting. Keith has found a shoemaker named John Row (sic) apprenticed to John Morgan, a cordwainer of Hitchin, as at 8th November 1785. He is almost certainly the John Roe, cordwainer, who would marry Mary Morrell at St Mary’s church, Hitchin, on 28th August 1788. Mary died only a year later, perhaps in childbirth – she was only 18 at the time – and was buried at Back Street Independent Chapel in Hitchin. 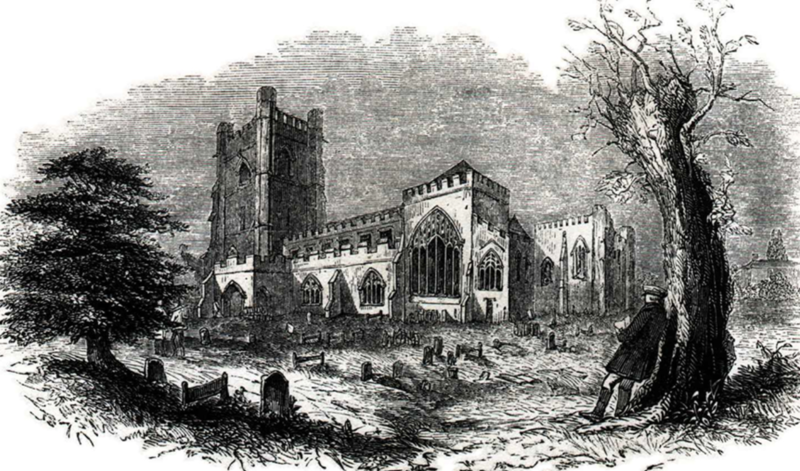 On 1st November 1792 John Roe, a widower, married Elizabeth Rosendale or Rossindale, also at St. Mary’s in Hitchin. Elizabeth was from Royston and seems to have been the daughter of James Rosendale and his wife Elizabeth Wheatley. Confirmation that this is the same John Roe who would live and work in Luton in the 1820s can be found in the name of one of the witnesses to this second marriage: James Rushmore, who would be John’s landlord – and perhaps his employer? – in Luton. Keith has found possible burial records for John and Elizabeth Roe in Luton. Elizabeth, who was said to have been born in 1770, died in 1833. John, born in 1763, died in 1836. Unfortunately, it has not yet proved possible to find birth or baptismal records for any children born to John and Elizabeth. However, given that they were married in 1792, it seems plausible that they could be the parents of the Elizabeth Roe who married first James King and then Lot Watson in Barkway – given that we know she was born in Luton, probably in 1793. Might she have been named after her mother? As for the Martha Roe who married John Sharp, also in Barkway, might she also be a daughter of John and Elizabeth Roe of Luton, who perhaps went to Barkway with her sister Elizabeth in search of work, and like her ended up marrying a local man? And could Martha’s name provide some kind of confirmation of the next link in the chain – the identity of John Roe’s parents? Keith Roe has discovered a Roe family living in and around Pirton, a village a few miles to the north of Hitchin, at around this time. Not only is there a good chance that they are related to the Roes of Luton, but they have a definite connection with Biggleswade and the Baptist community there. Thanks to the excellent Pirton local history website, we know a good deal about the family of William and Martha Roe who lived in the village in the late eighteenth and early nineteenth centuries. Piecing together information from wills and parish records, we can determine that William Roe was probably born in the 1720s. He was married twice, firstly in 1747 to Ann Hanscombe in Ickleford, Hitchin, and secondly, following Ann’s death in 1766, to Martha Moss, in Arlesey, just across the county border in Bedfordshire. According to Keith’s research, Martha was the daughter of Peter Moss and his wife Mary Ingoldsby. 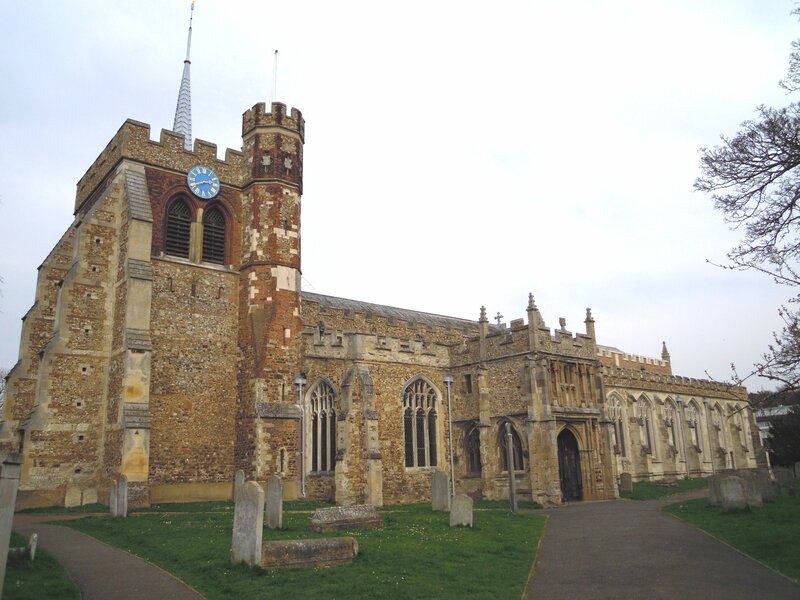 They had another daughter, Mary, born in Sutton, Bedfordshire, in 1732, and this is where the connection to the Baptists of Biggleswade comes in. On 15thOctober 1751, in Potton, Mary Moss married Reverend David Evans. Born in Mydffai, Camarthenshire, David had previously been a Baptist minister in Hook Norton, Oxfordshire, and took up his post in Biggleswade in the same year that he married Mary. After his death in 1786, it would seem that his widow Mary went to live with her sister Martha in Pirton: that was where she made her will in 1806. William and Martha Roe had three children that we know of from Martha’s will of 1817, from which we also know that William had predeceased her. There were two sons, John and Daniel, and a daughter Ruth. She had married George Odell in 1792, had two daughters – Mary in 1800 and Martha in 1804 – and then died, probably in the process of giving birth to the latter. Unfortunately we don’t have birth records for John, Daniel and Ruth – perhaps because the family were Dissenters. Both Martha’s will and that of her sister Mary Evans mention John Geard, minister of Tilehouse Street Baptist Church in Hitchin, whose extensive memoir (which can be accessed online) makes repeated reference to Rev. David Evans. Why is the connection to David Evans and the Biggleswade Baptists important? Because it may help to explain how my 3rdgreat grandmother Eliza Holdsworth found her way from Whitechapel to Bedfordshire, and how she came to marry Daniel Roe. We know that Eliza’s mother’s surname was Evans – her father William Holdsworth married Lydia Evans in London in 1792 – and that she was the daughter of Francis and Elizabeth Evans. We also know that, when Eliza married Daniel Roe in Blunham in 1825, the witnesses were Mary Evans and William Bowtell. Mary may have been one of the daughters of Caleb Evans, a Biggleswade malt-maker who was also a part-time Baptist preacher. His other daughter Martha (you can see a certain naming pattern emerging here) married a James Bowtell in 1826. In 1841, the widowed Eliza Roe, née Holdsworth, and her children would be living just a few streets away from the Evans and Bowtell families. Caleb Evans’ wife Ann was a Marsom by birth, born in Potton in 1771, and from a long-established Bedfordshire Baptist family, one of whose members, Thomas Marsom, had founded the first Baptist church in Luton, and who had been imprisoned with John Bunyan, at which time he is said to have persuaded the latter to publish the book that would become Pilgrim’s Progress. To date, I haven’t been able to establish any definite connection either between Caleb Evans and Rev. David Evans (might he have been his son? ), or between either of them and the Francis Evans whose daughter Lydia married William Holdsworth. However, it seems likely that Eliza initially came to Bedfordshire to stay with her father’s Evans relations, and that through them she met Daniel Roe, whose family was linked to Rev. 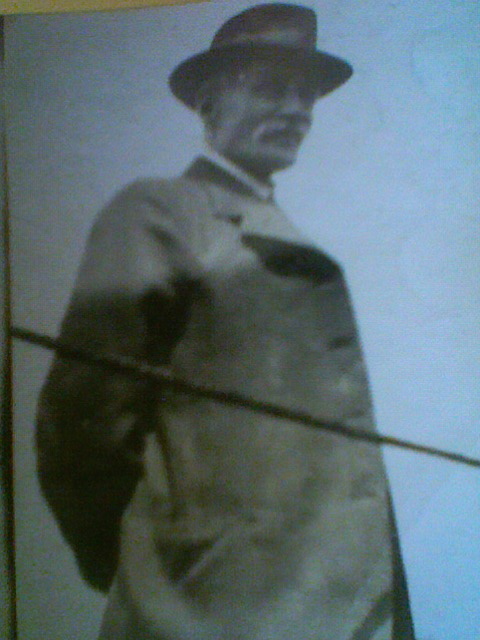 David Evans through his marriage to Mary Moss. This makes it likely that there is some kind of connection between my ancestor Daniel Roe and the Roes of Pirton. We know that William and Martha Roe of Pirton had sons named John and Daniel. Might their son John have been the Luton shoemaker who married Elizabeth Rosendale and had daughters Elizabeth and Martha (named after her Pirton grandmother?) who moved to Barkway? And might their other son Daniel be the Biggleswade shoemaker who married Eliza Holdsworth? Or is it more likely, as Keith Roe speculates, that ‘our’ Daniel was actually the grandson, rather than the son of William and Martha Roe of Pirton – which would mean that either John Roe of Luton or his brother Daniel could be my 4thgreat grandfather? Is it also possible that the Roe families that I previously found living in Luton later in the 19th century were related to the Roes of Pirton? William and Peter Roe were both shoemakers. William’s children included sons named John, Daniel and William, while Peter also had a son named Daniel. William was said to be born in about 1811 and Peter in 1801. Could they be sons of the John or Daniel Roe, who were the sons of William and Martha of Pirton? The coincidence of Christian names, and of occupations, would certainly seem to point in that direction. Keith Roe’s diligent research has certainly opened up some exciting new lines of enquiry, and I’m grateful to him for sharing his findings with me. Incidentally, Keith is the son of Ron Roe, to whose pioneering research those of us working on the history of these families all owe a huge debt.